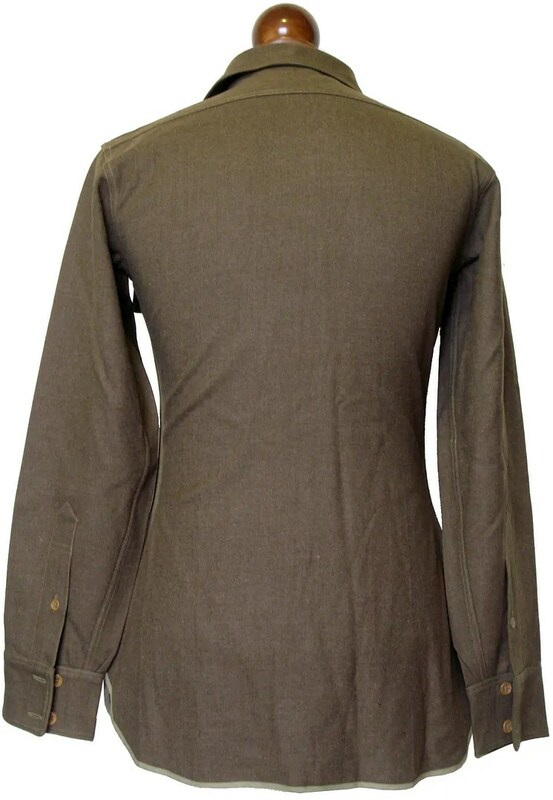 This vintage shirt was made in the 1940s. 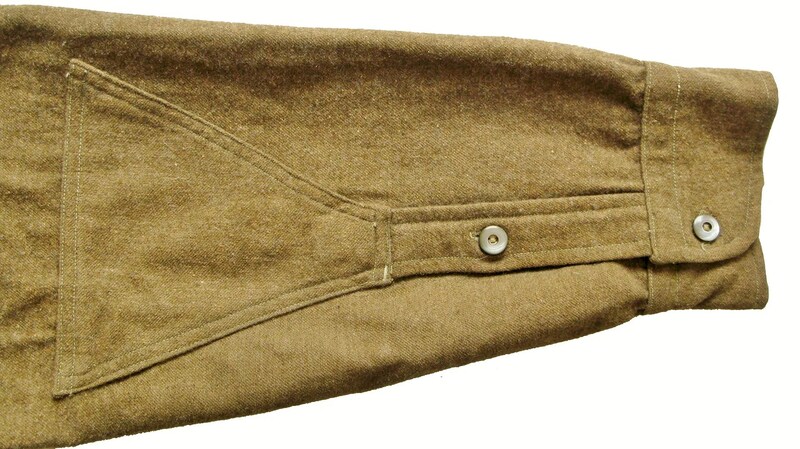 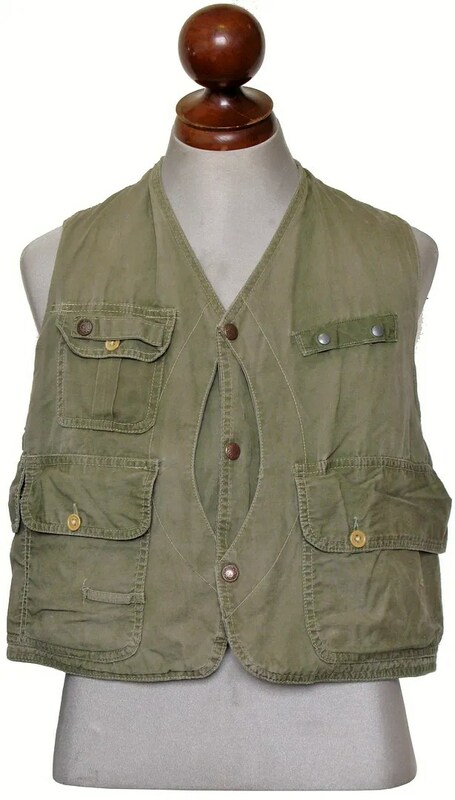 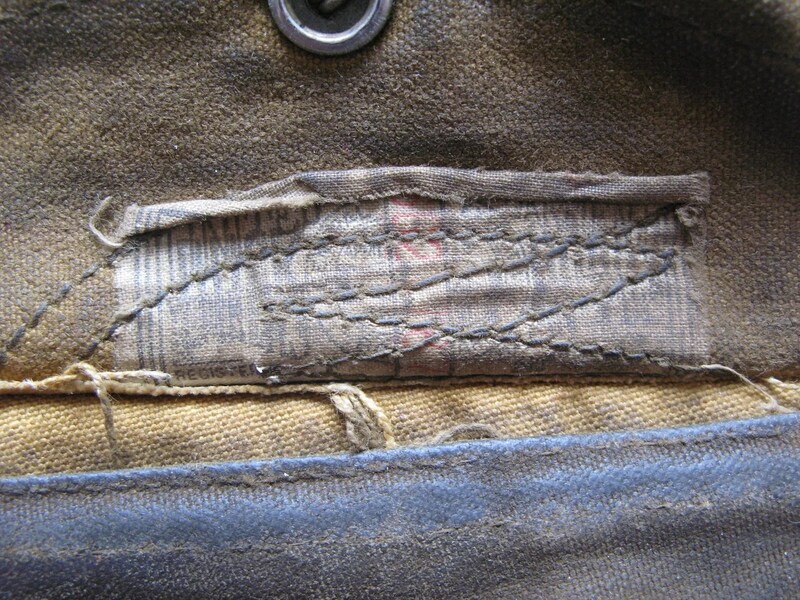 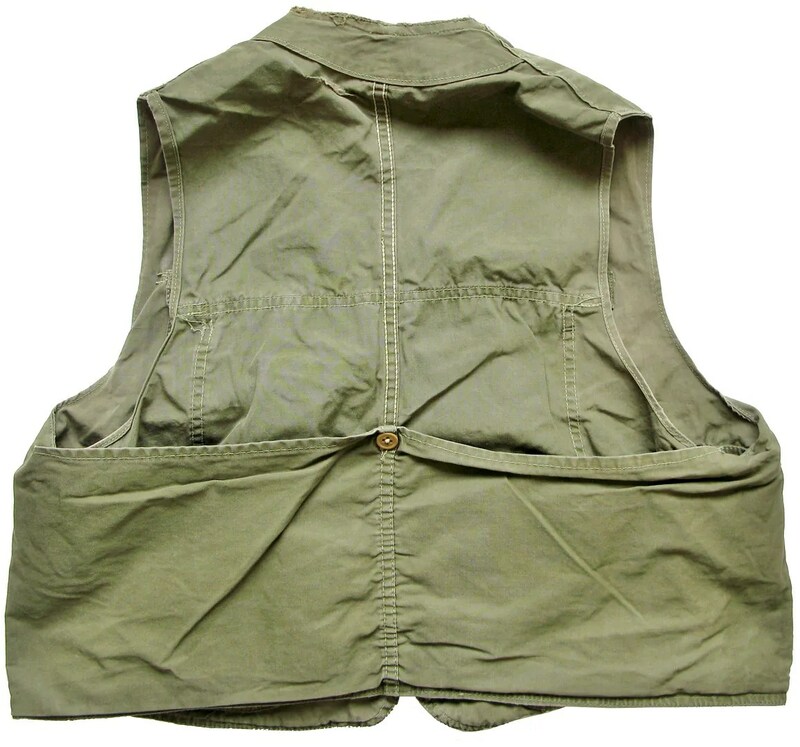 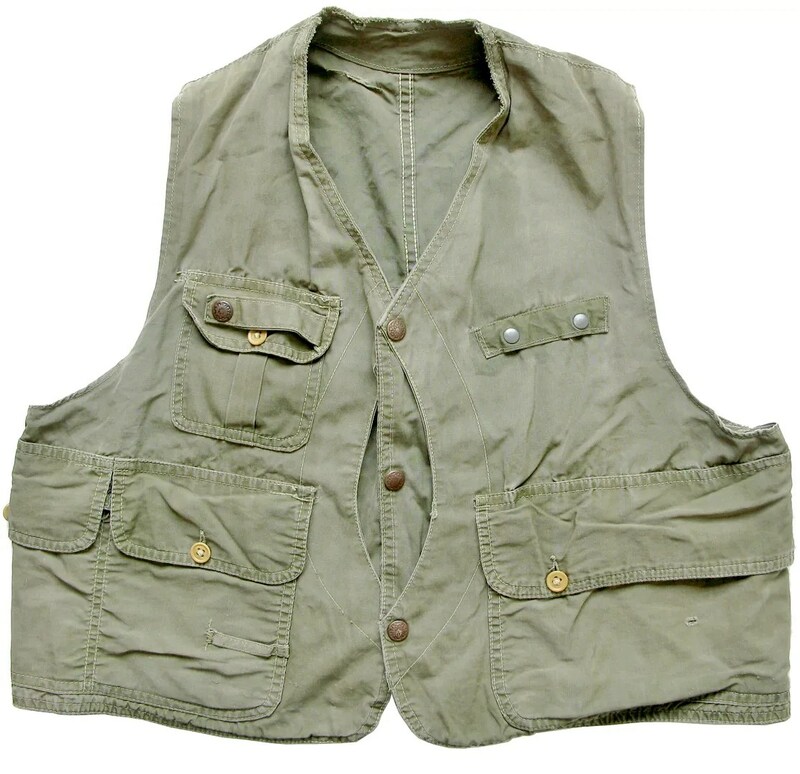 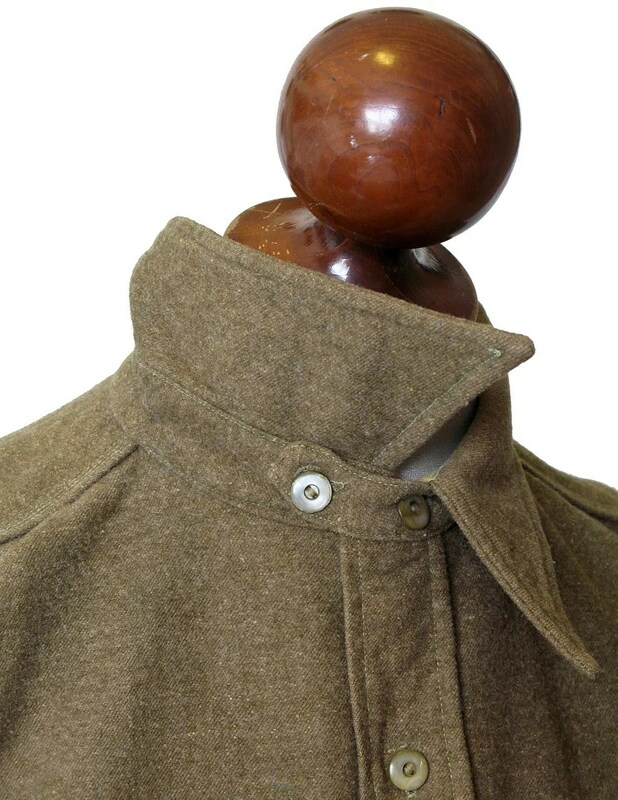 it has two chest pockets one with a pencil pocket, double button cuffs and epaulettes. 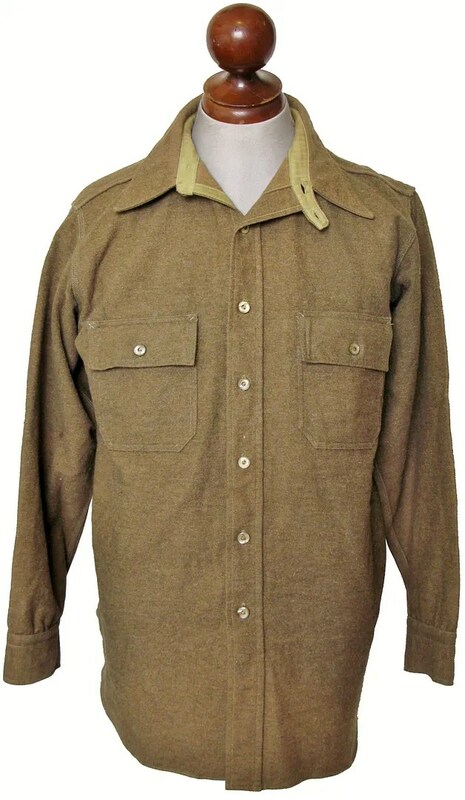 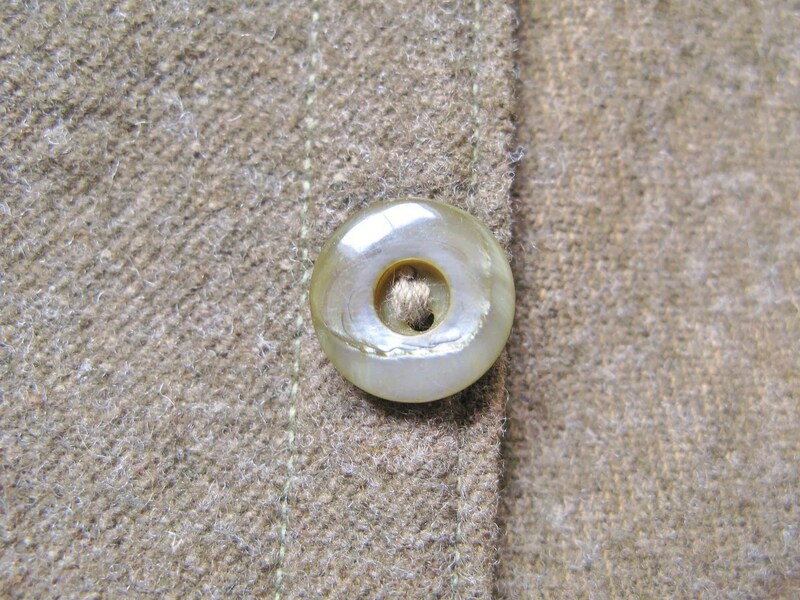 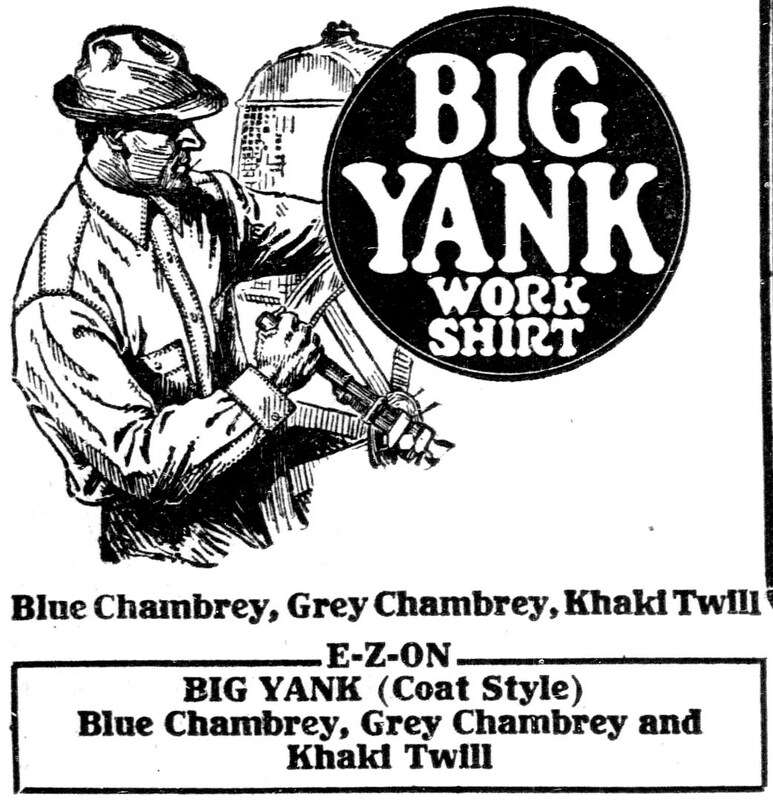 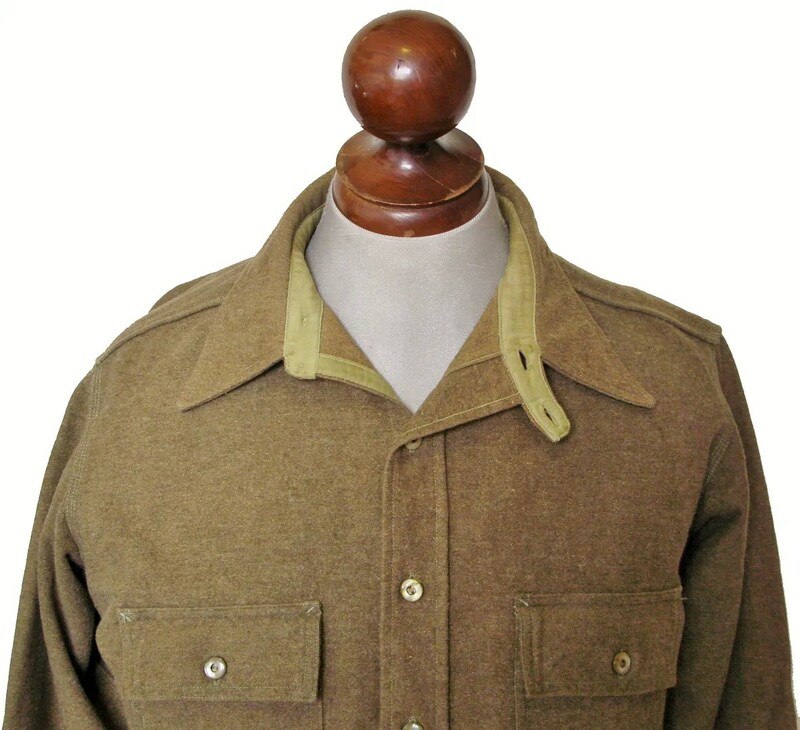 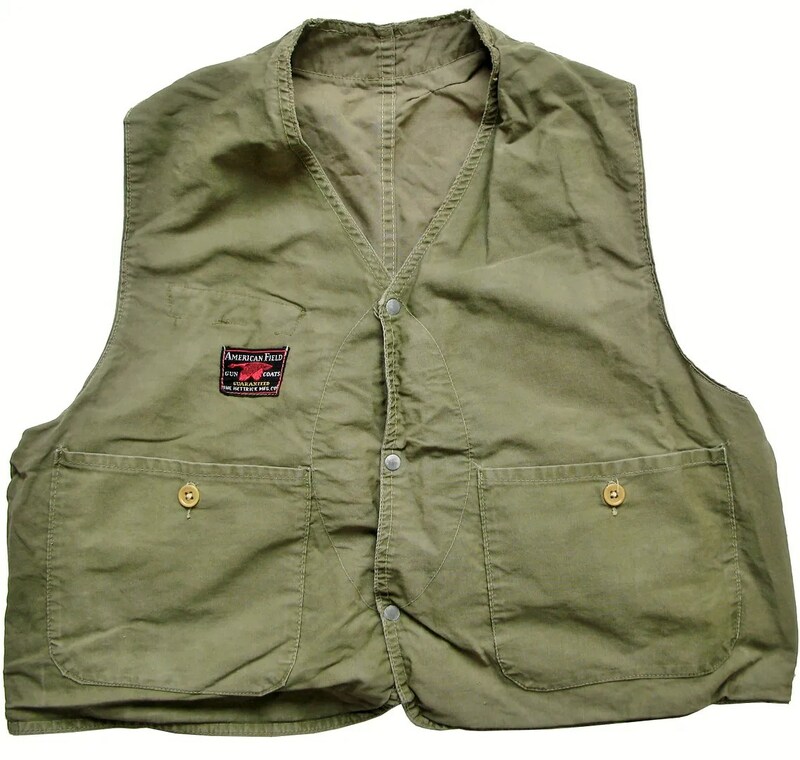 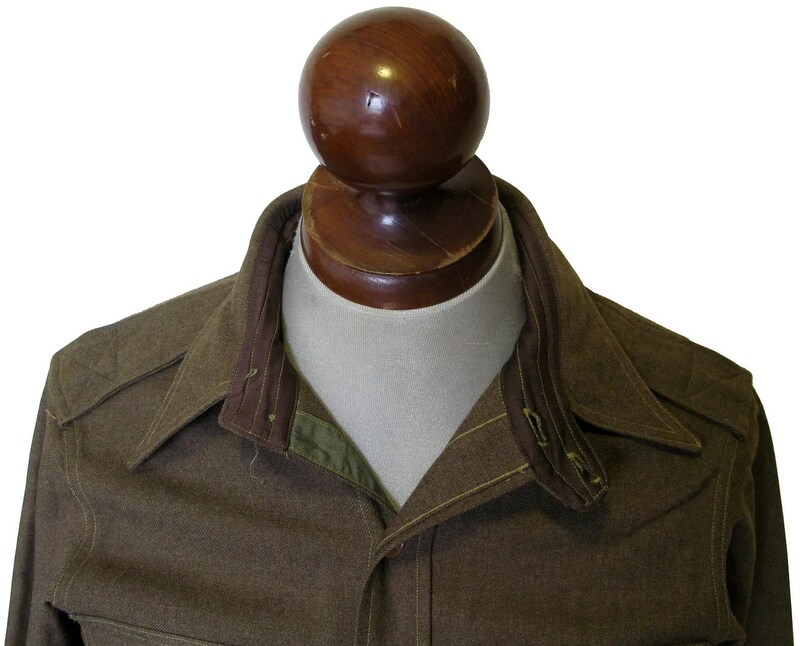 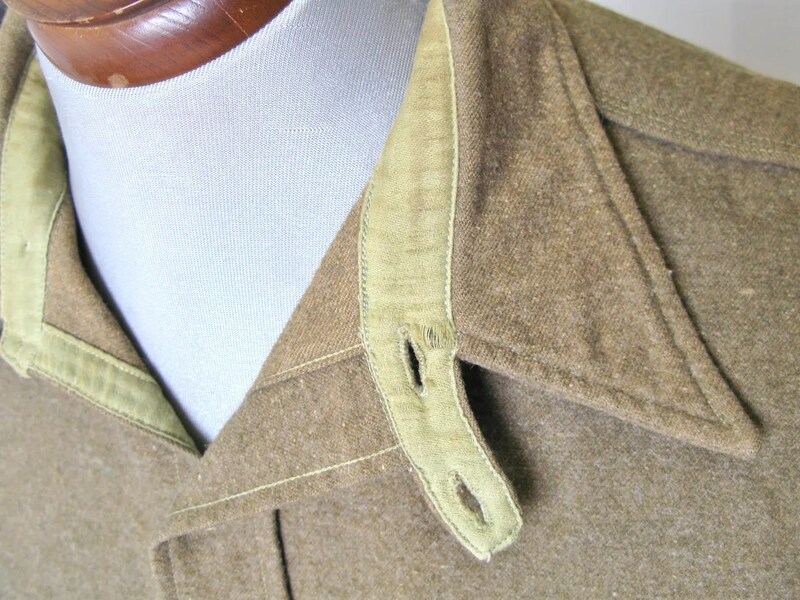 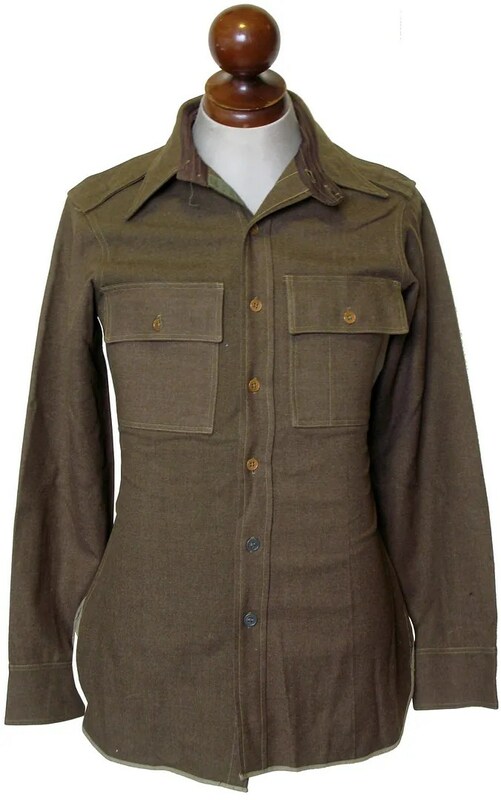 It has a chinstrap collar stand, a detail common on workshirts of the 1920s-1930s. 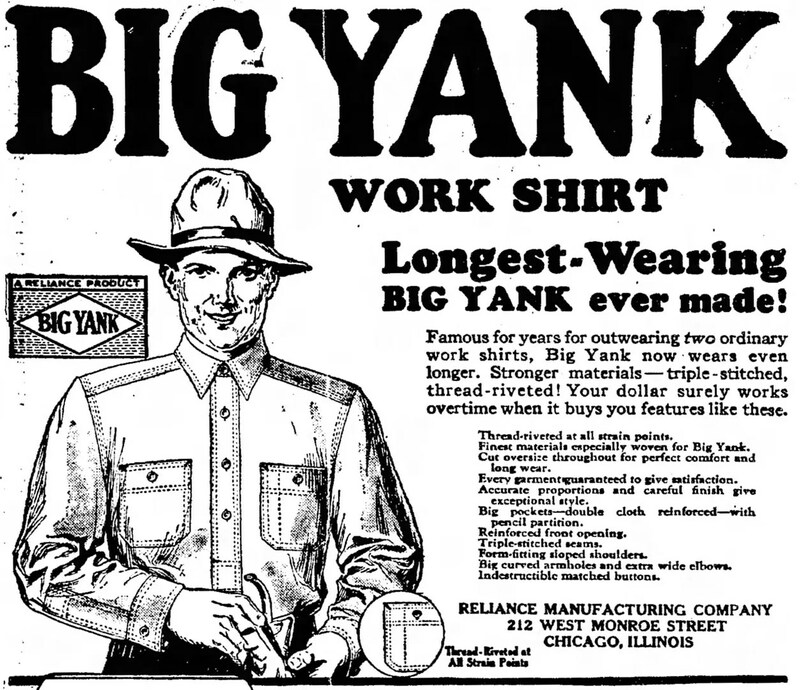 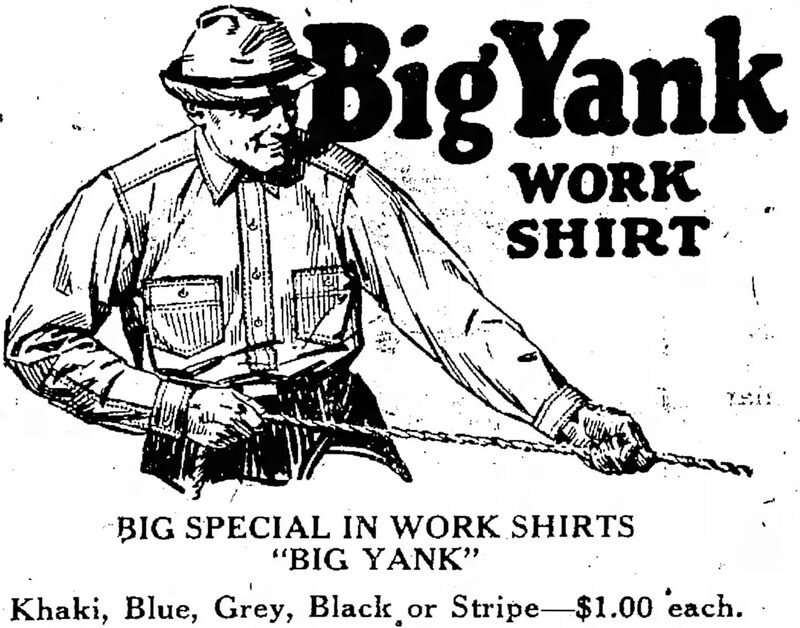 The maker of this shirt likely was primarily a maker of those workshirts before being awarded the contract to make this one for the Army. 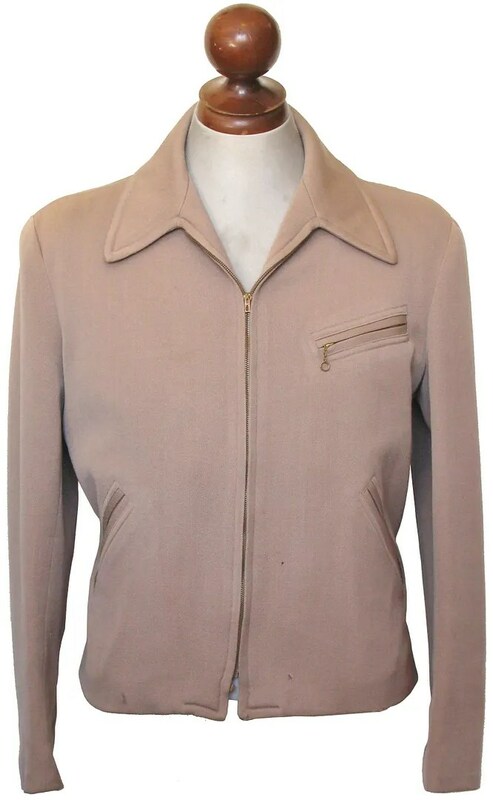 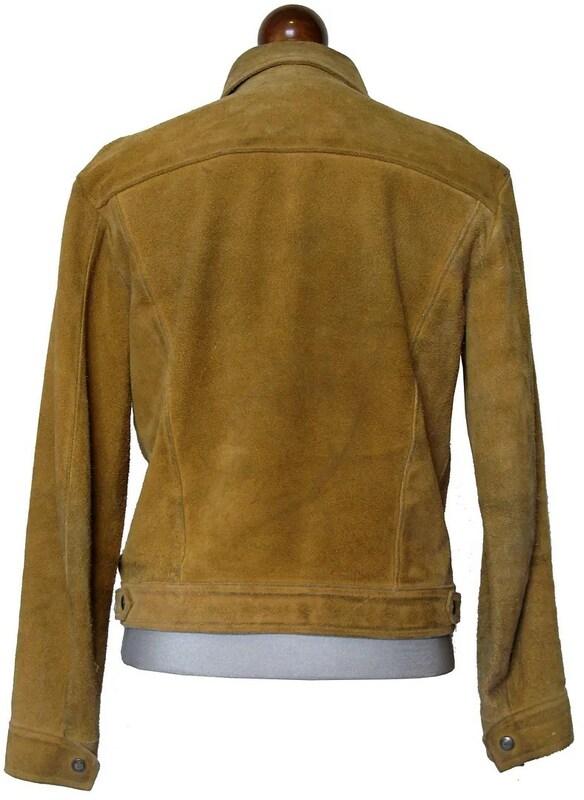 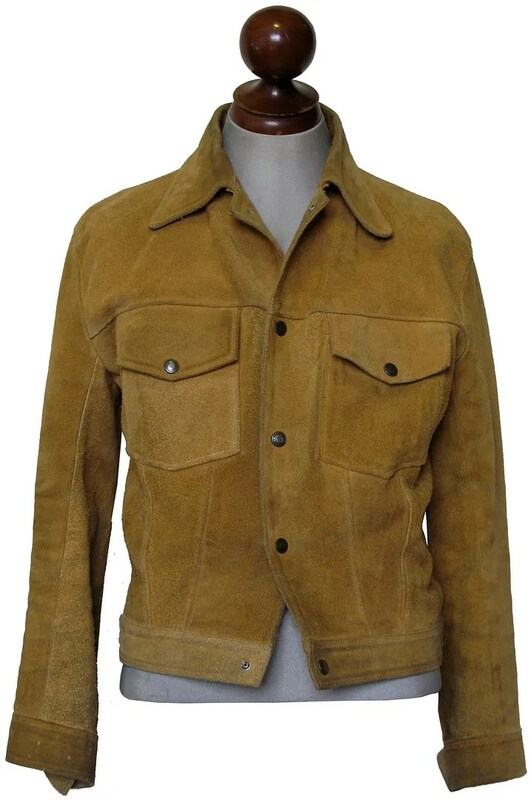 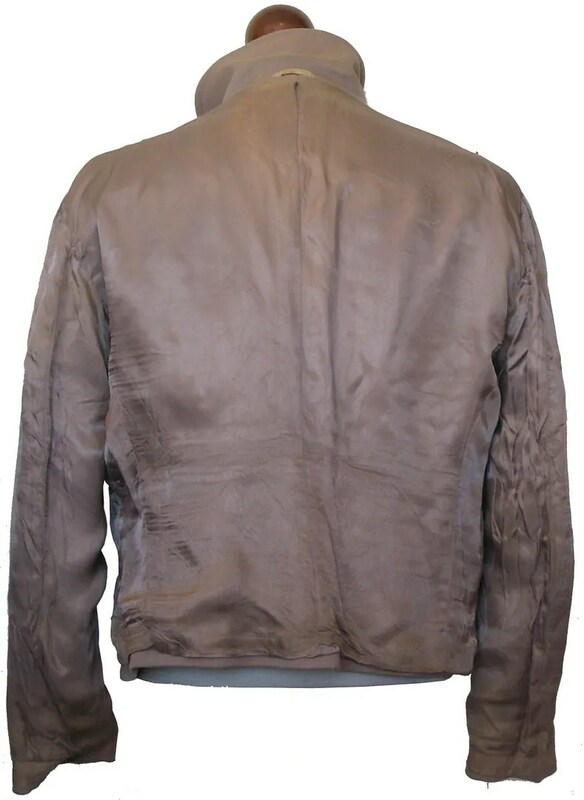 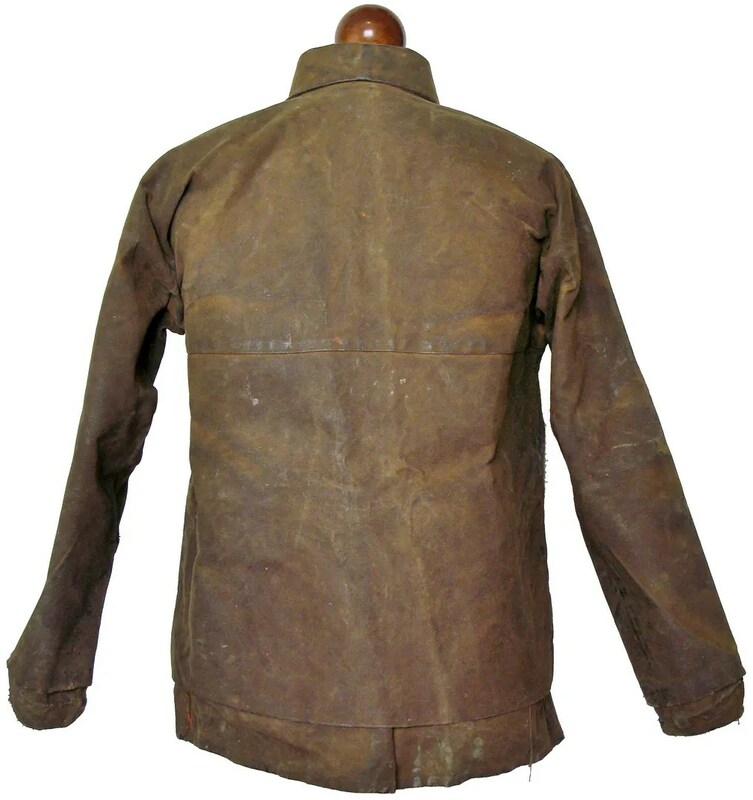 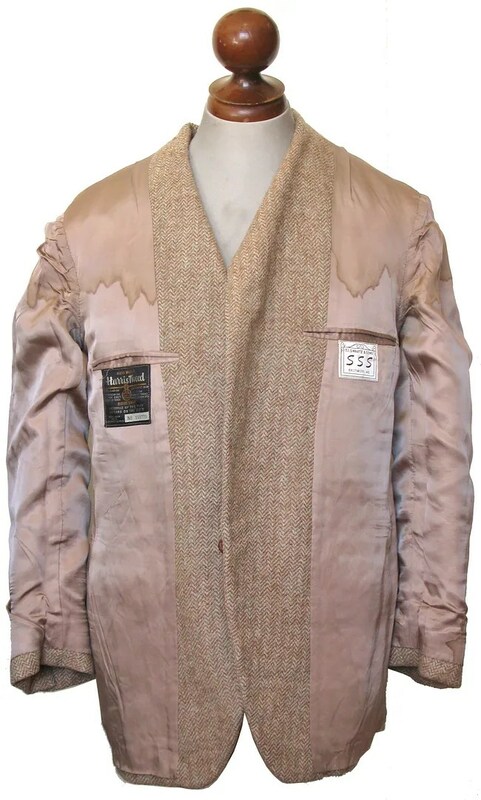 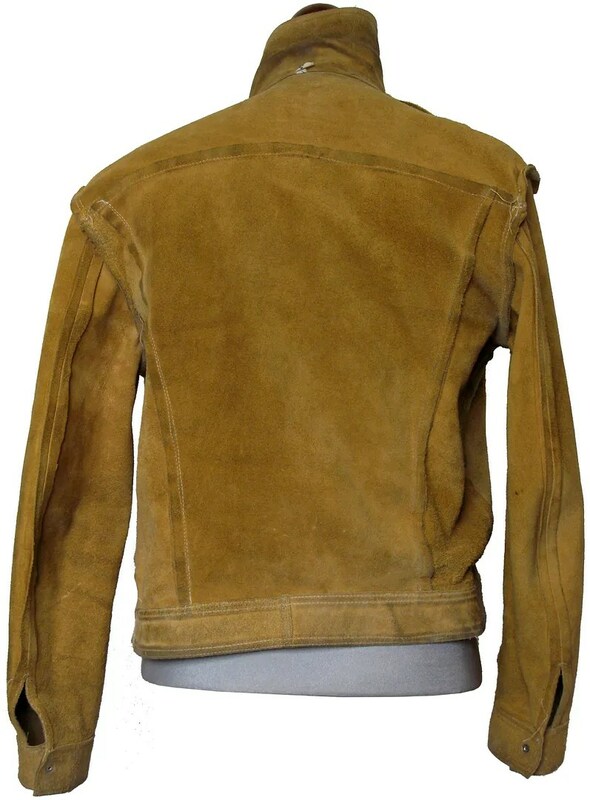 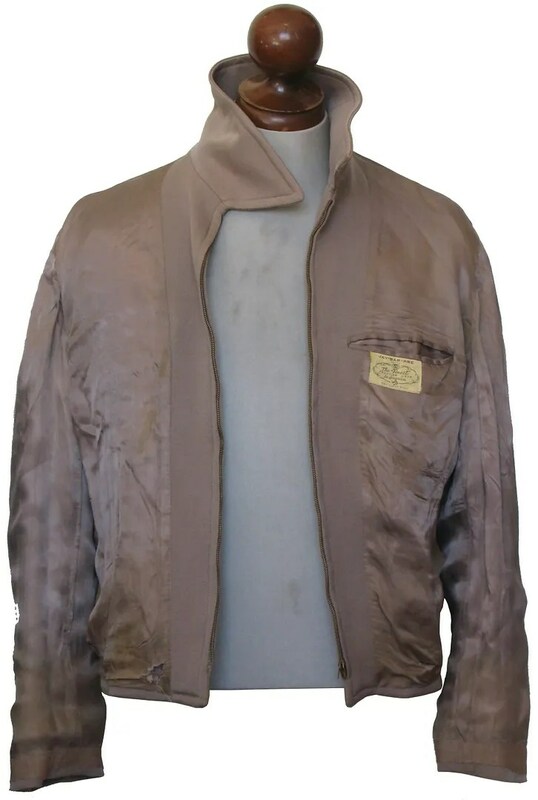 This vintage suede leather jacket was made in the 1960s or 1970s. 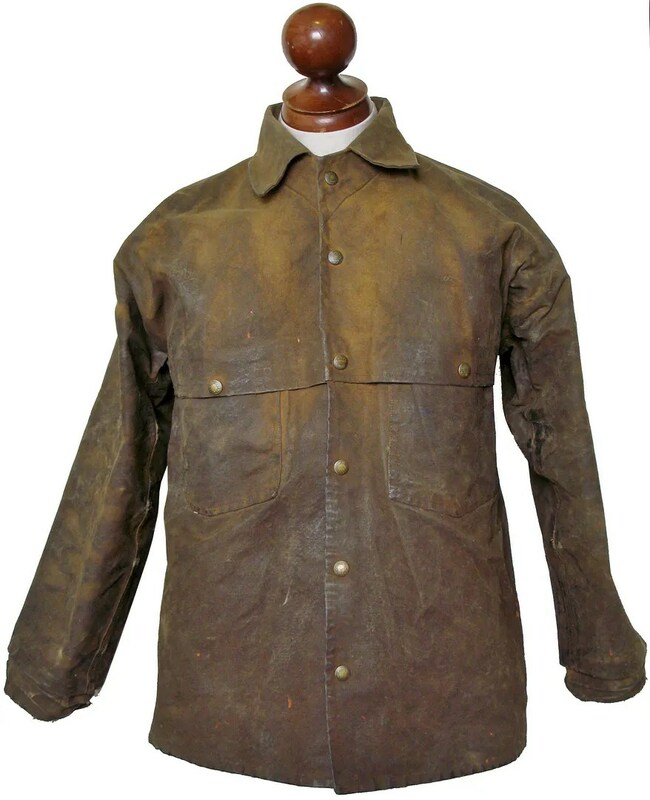 It is made in a two pocket trucker style- the leather version of a classic denim jacket. 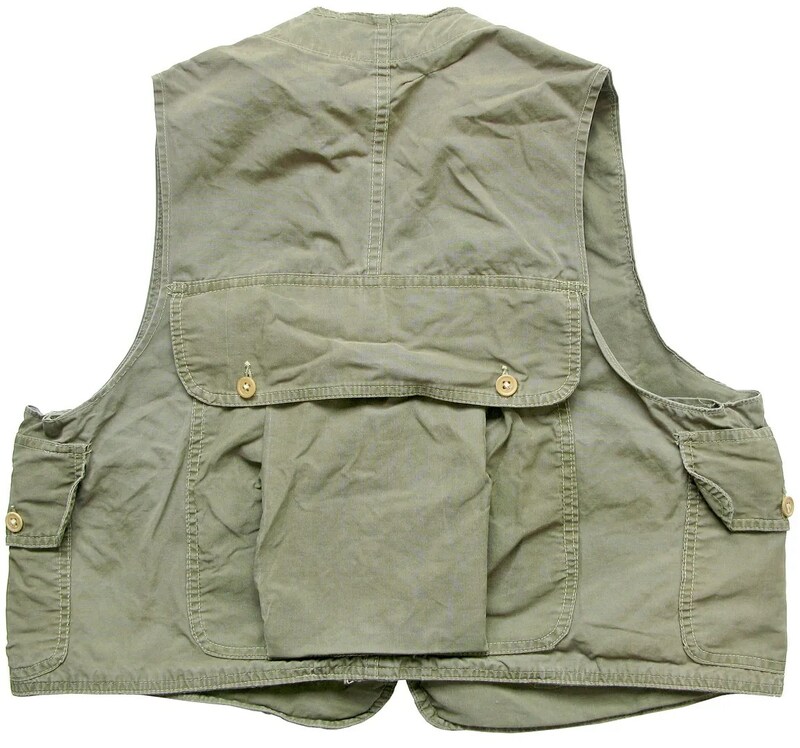 It is snap front and unlined. 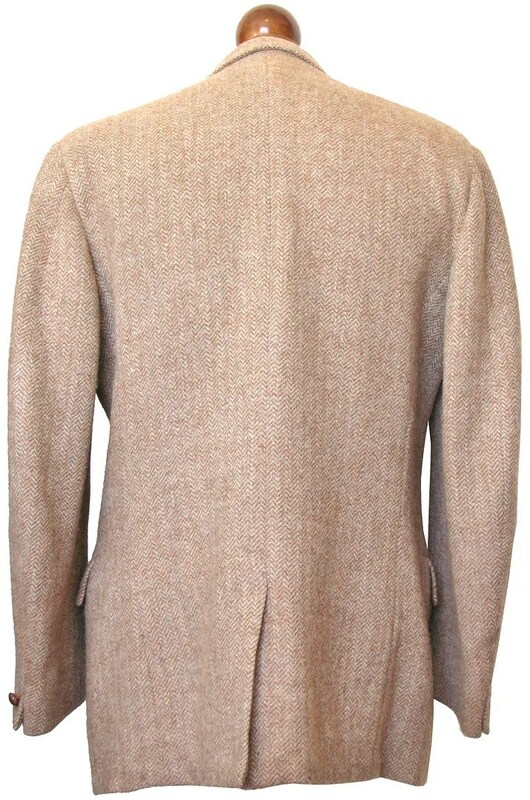 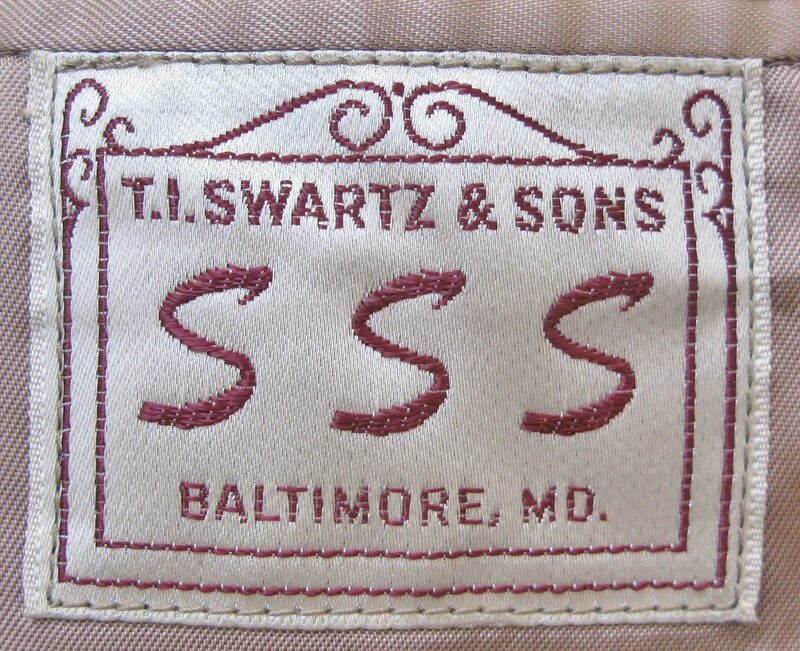 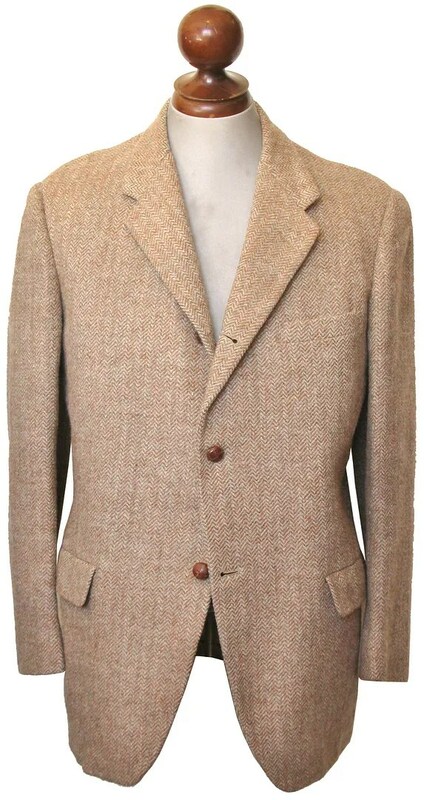 This vintage tweed jacket was made in 1952 by T.I Swartz & Sons, Inc. of Baltimore, Maryland for A.A. Marsteller. 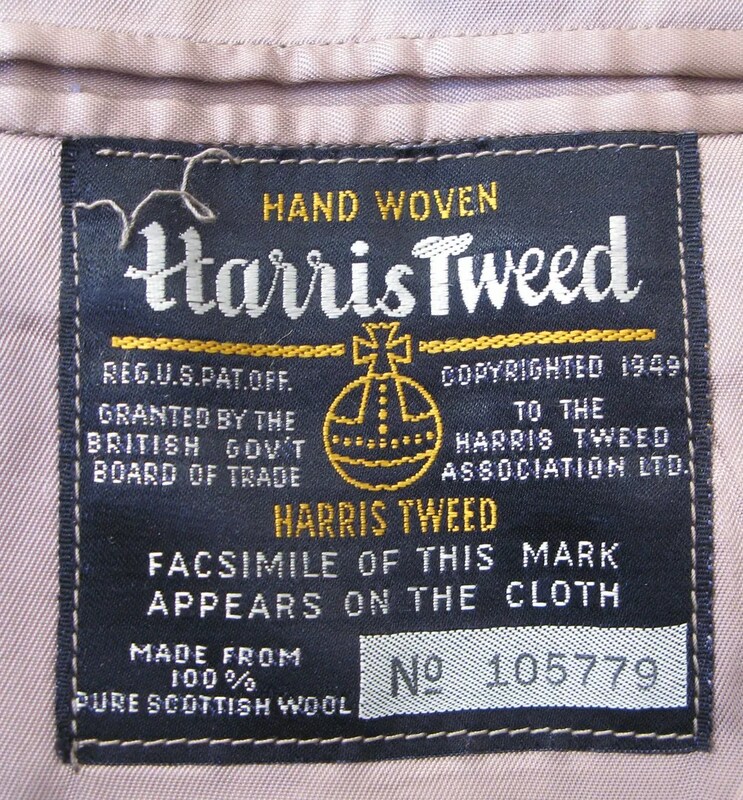 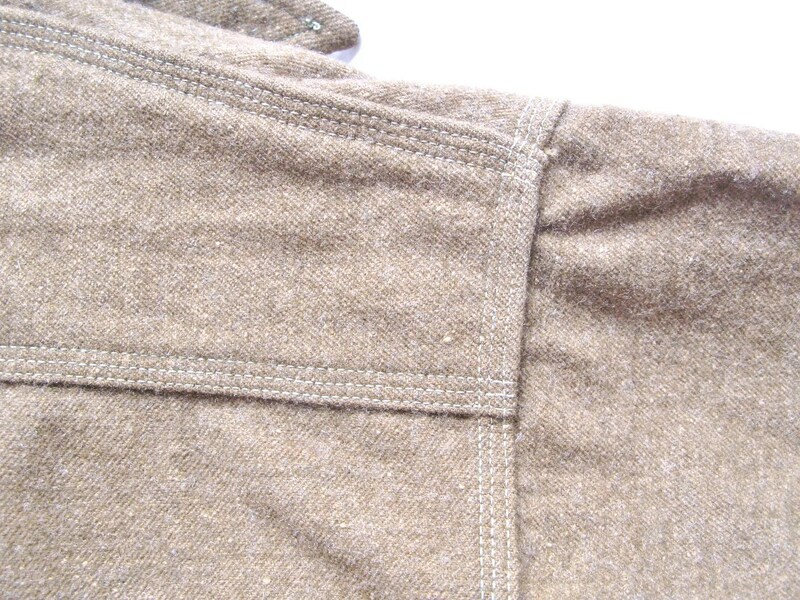 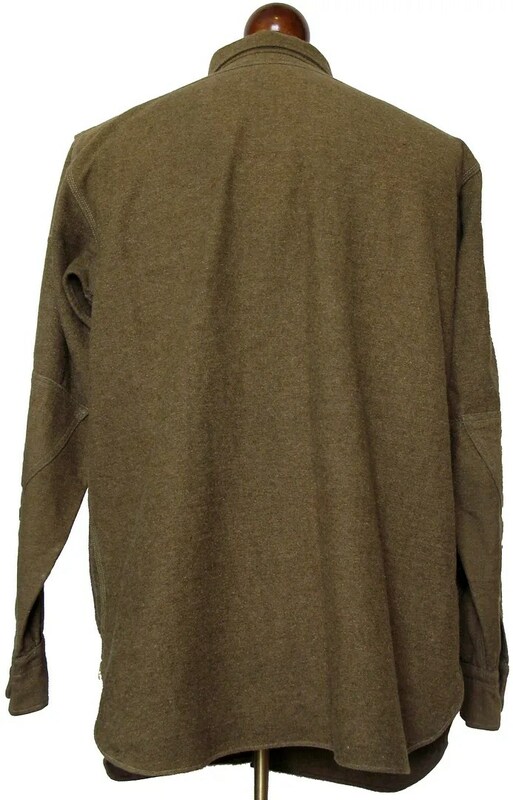 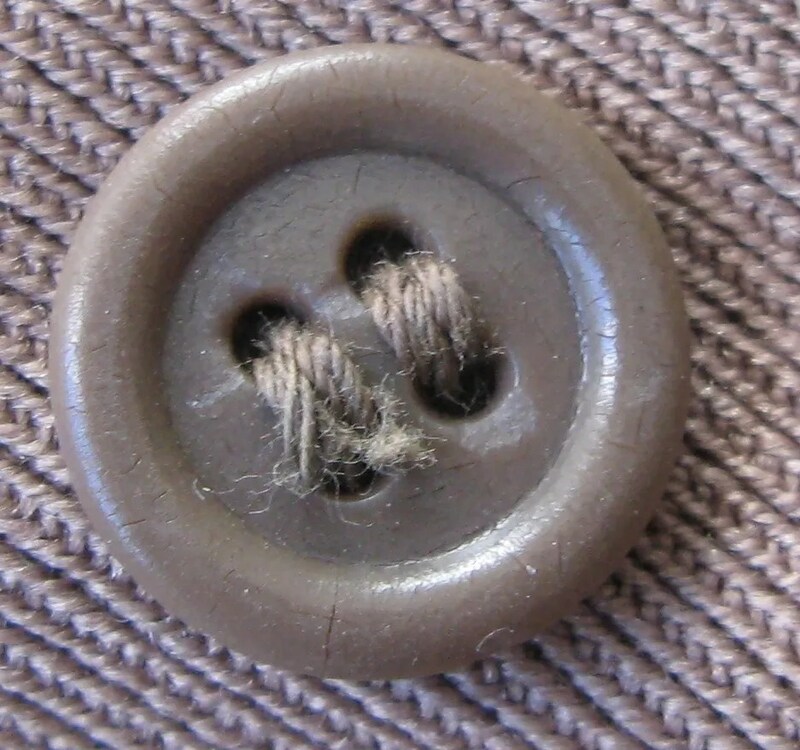 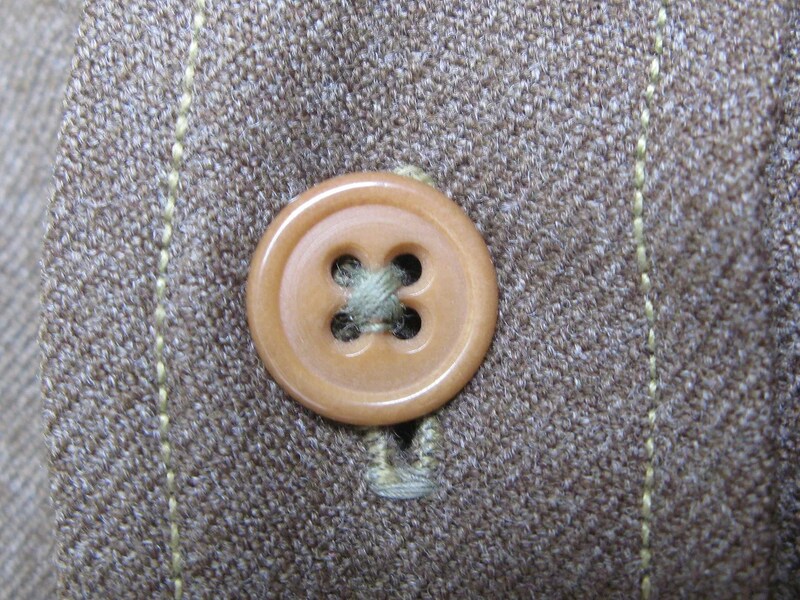 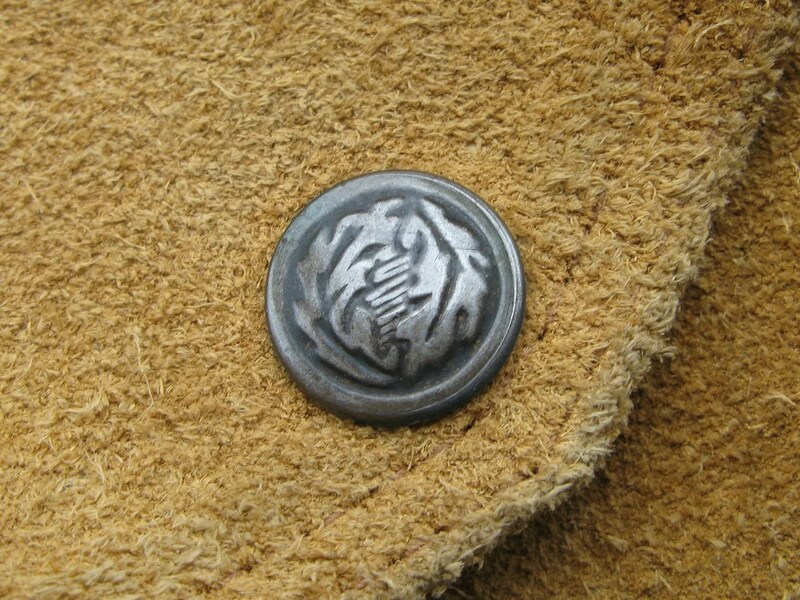 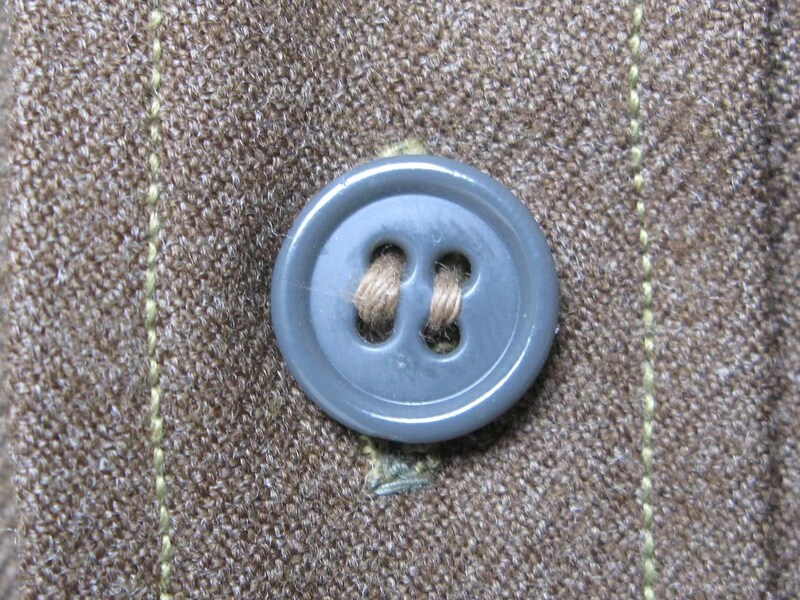 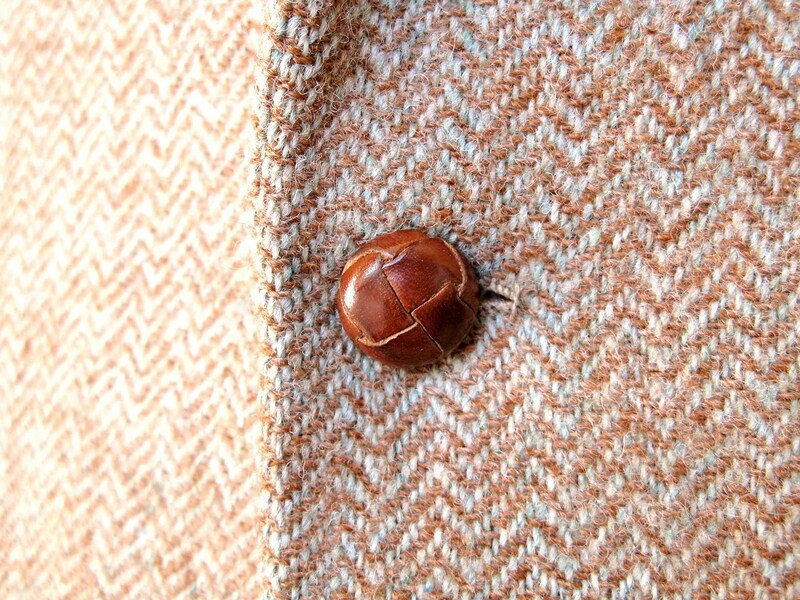 It is made from brown herringbone Harris Tweed, and bears the 1949 label design. 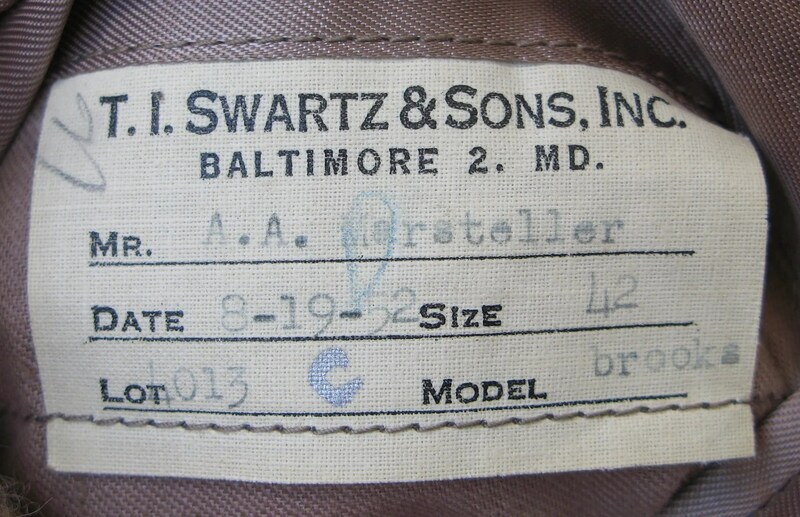 It has a 1949 union label. 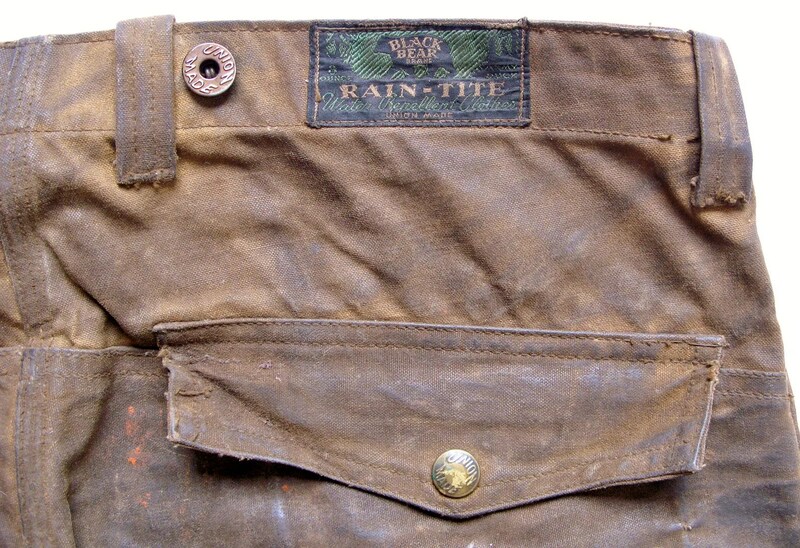 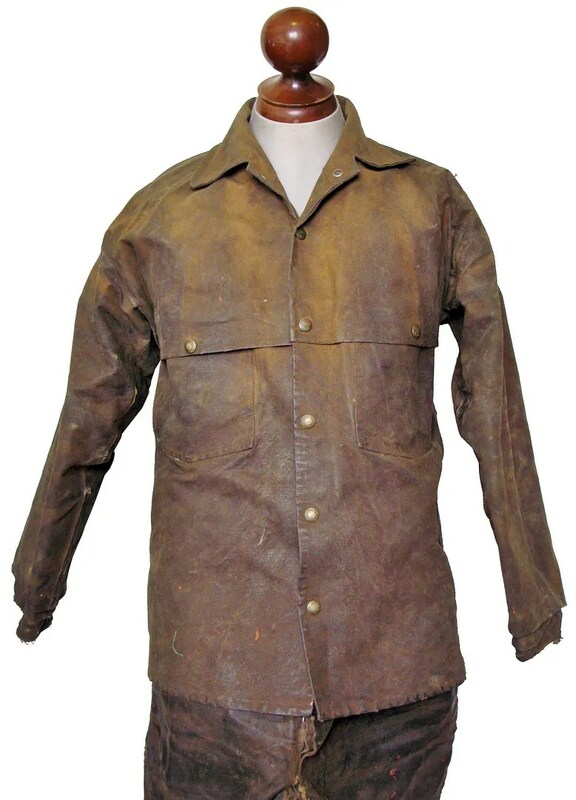 This vintage suit was made in the 1930s in Seattle, Washington by high end workwear and outdoor-garment manufacturer Black Bear Brand as part of their “Rain-Tite” water repellent clothes range. 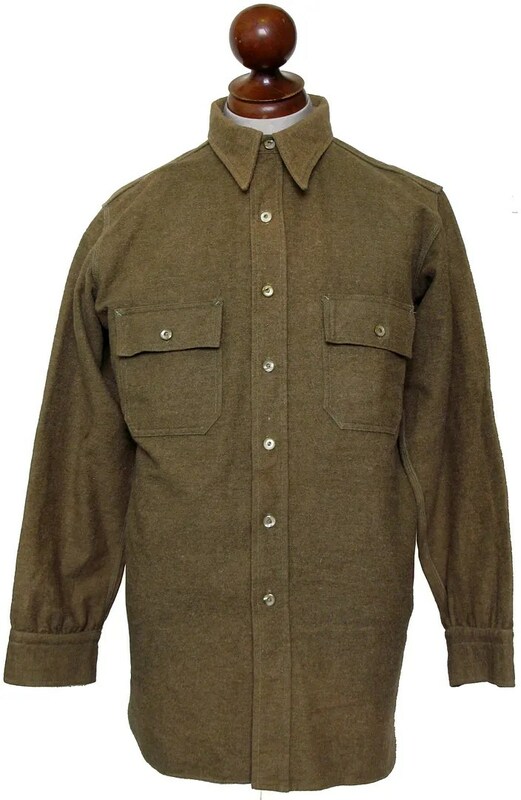 Black Bear Brand produced work shirts, pants, overalls, jackets and mackinaws from their plant on Rainier Ave. S. This suit is made from army duck canvas, the jacket from 10oz duck and the pants from 8 oz duck. 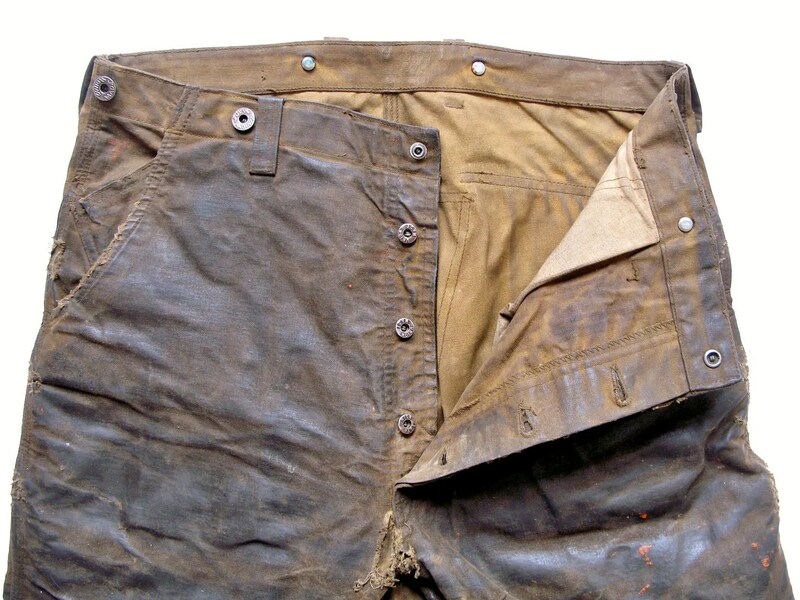 It appears they both started out life a medium brown canvas, but years of wear and layers of waterproofing have darkened it. 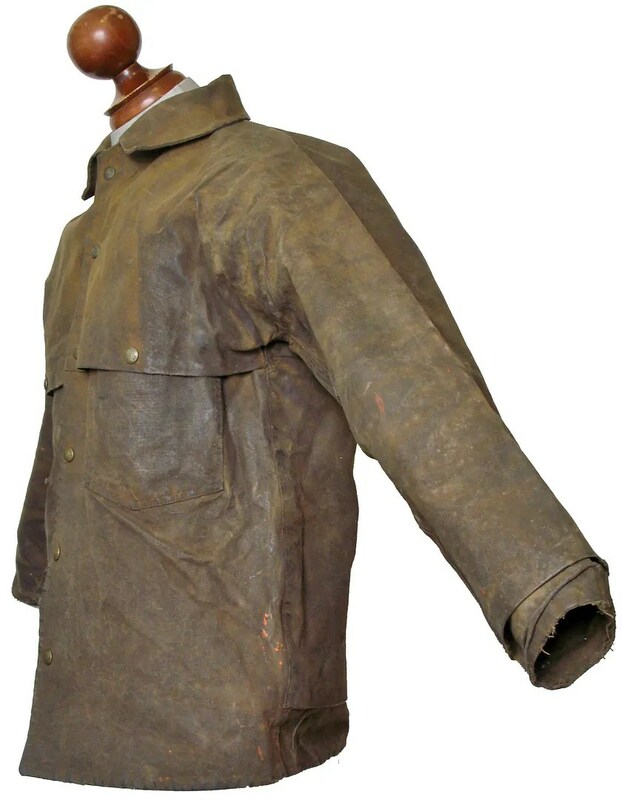 Both are extremely heavy duty, and are physically heavy and stiff, both from the material and from the wax proofing. 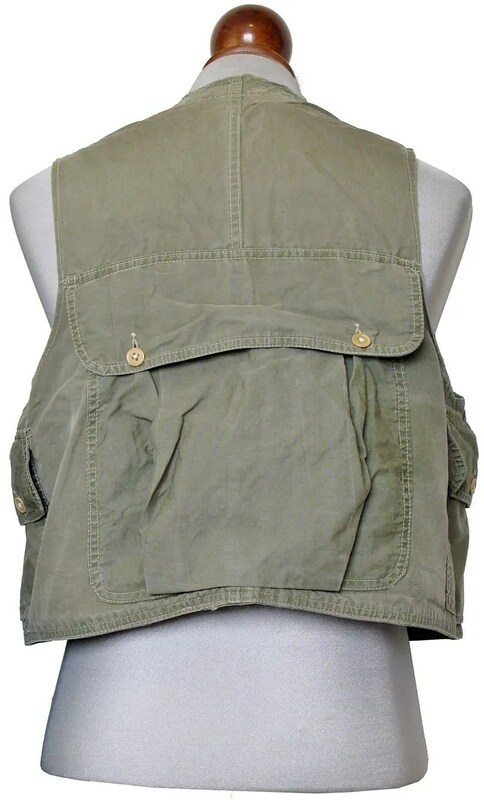 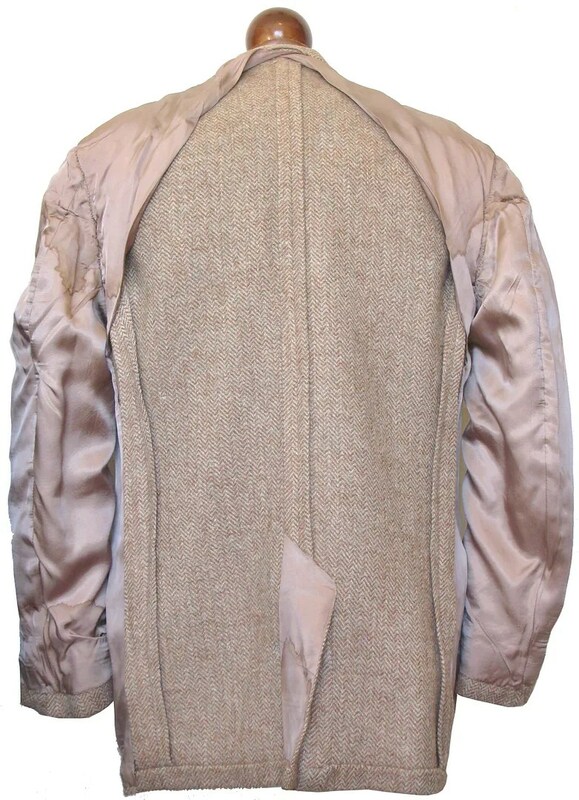 The back of the jacket is two layers of the 10 oz canvas through the body, with three layers on the shoulders. 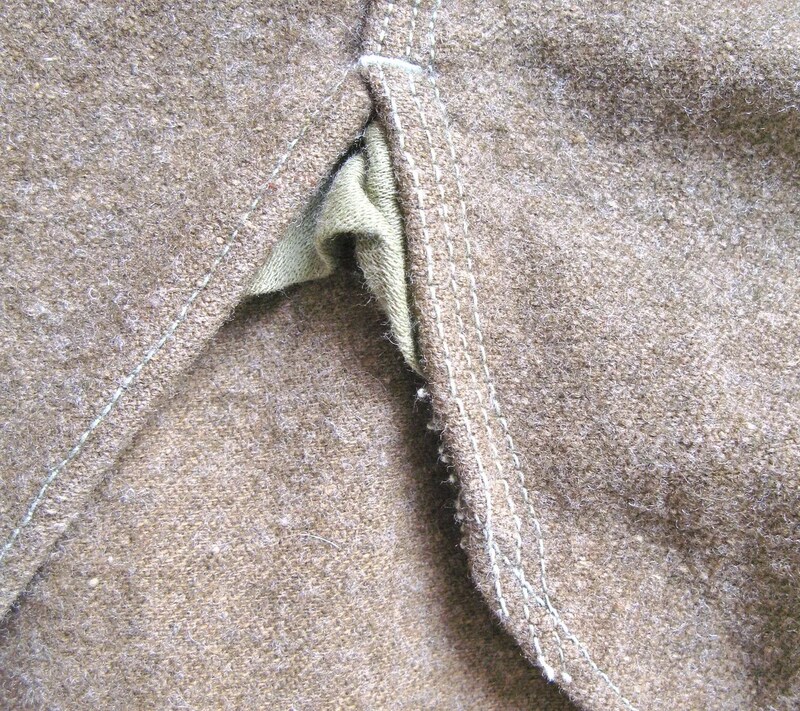 The sleeves are two layers. 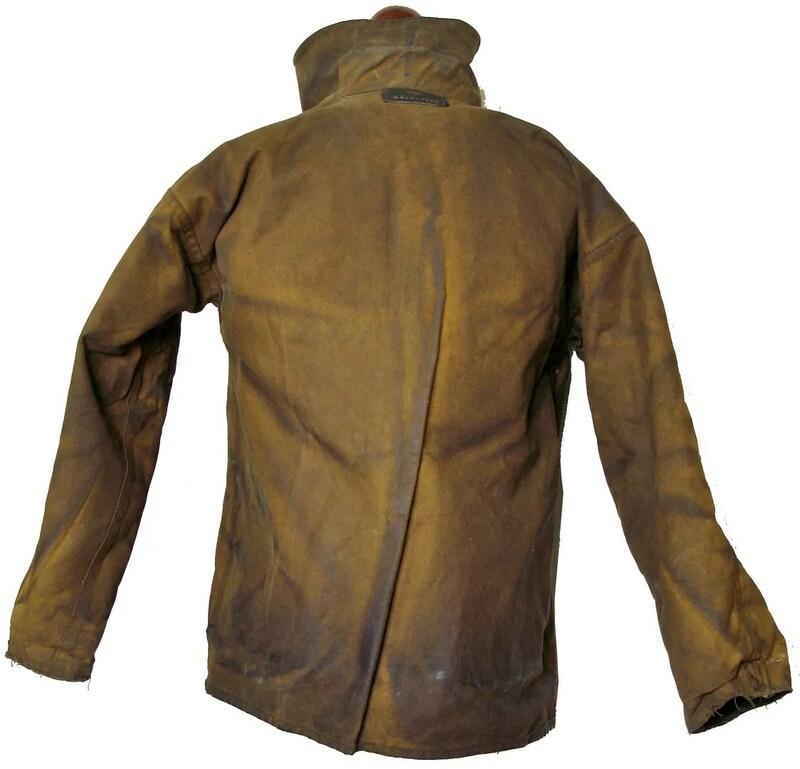 It is constructed with overlapping capes and layers to keep everything dry in harsh weather. 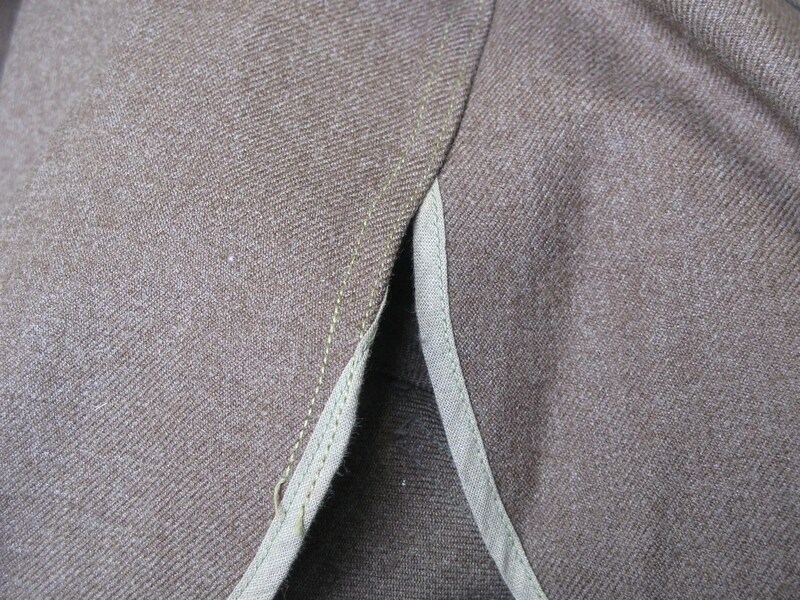 The pants are two layers as well. 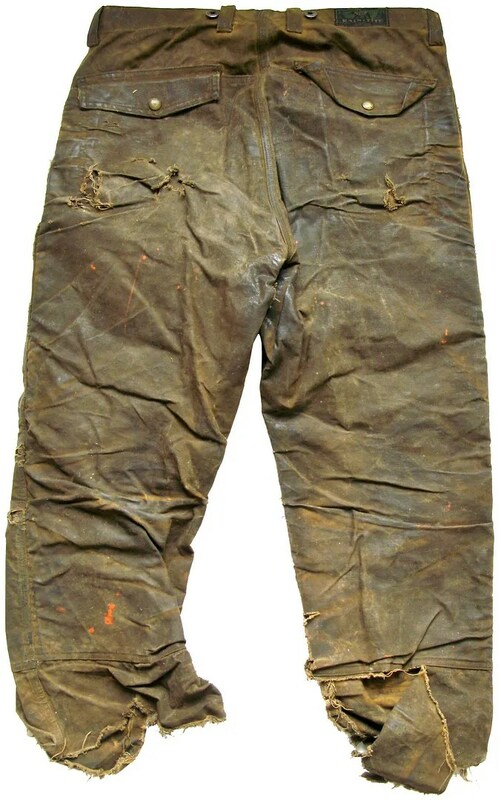 They are cut to be worn with tall boots. 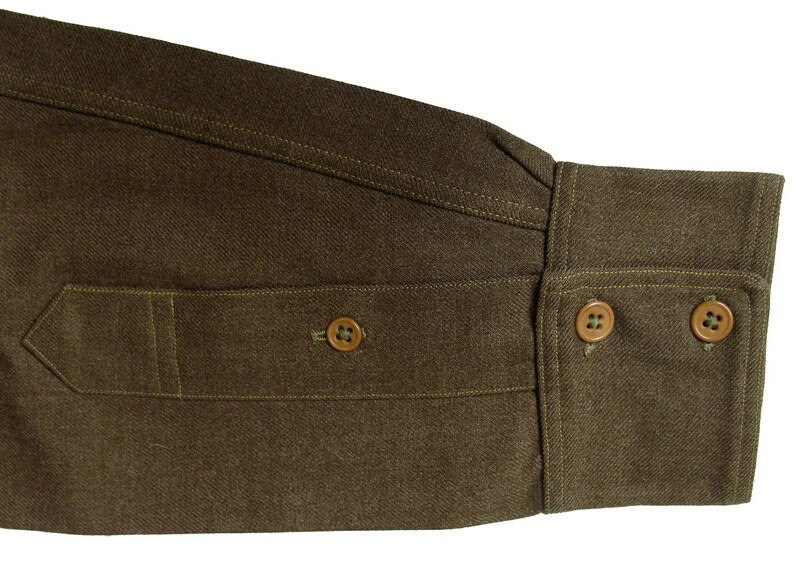 They have suspender buttons and belt loops. 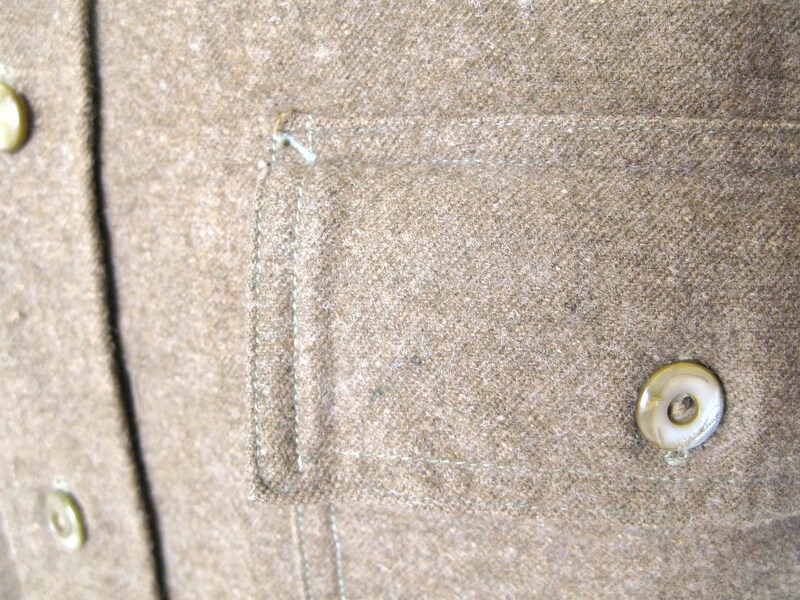 There is a crotch gusset, and a patch watch pocket inside the side pocket. 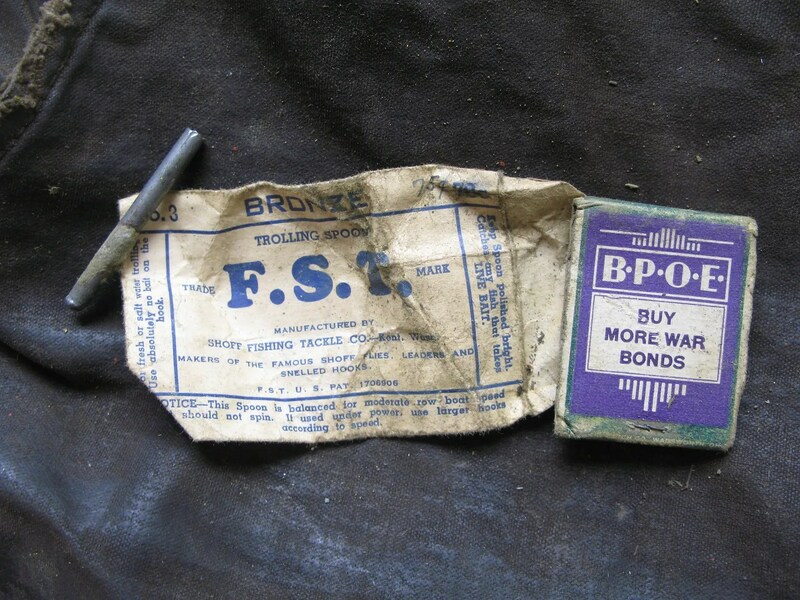 In the pocket of the pants, I found the package of a trolling spoon and an Elks matchbook advertising war bonds. 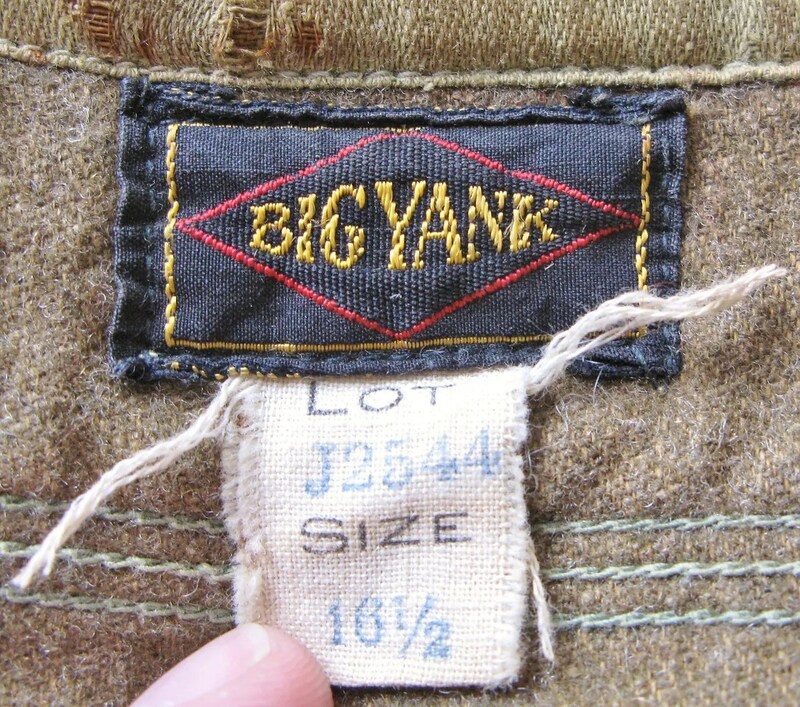 This suit probably hasn’t been worn in a good 70 years or so if those are still in-tact in the pocket. 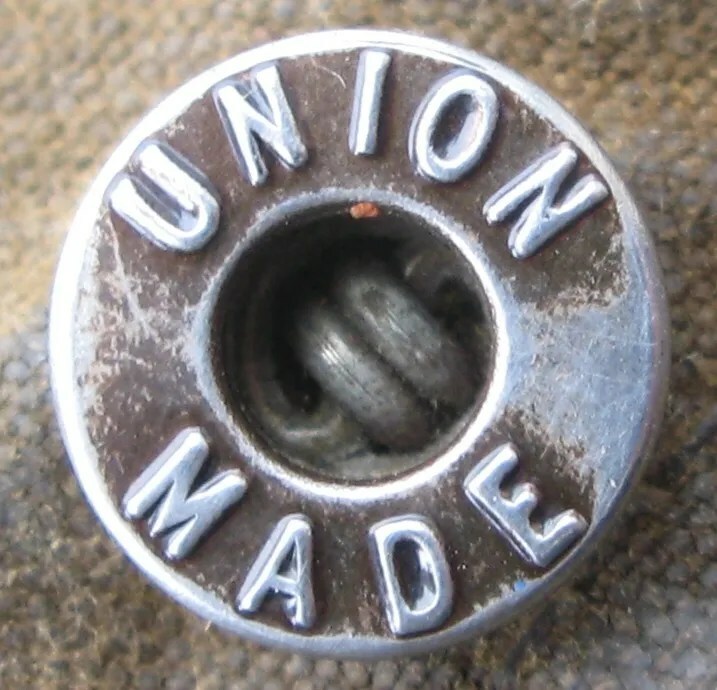 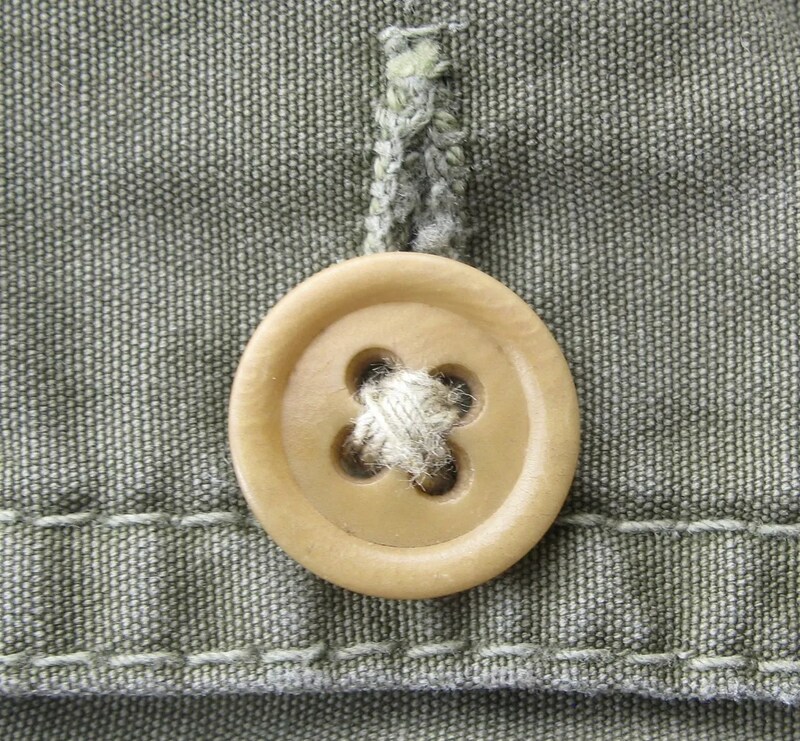 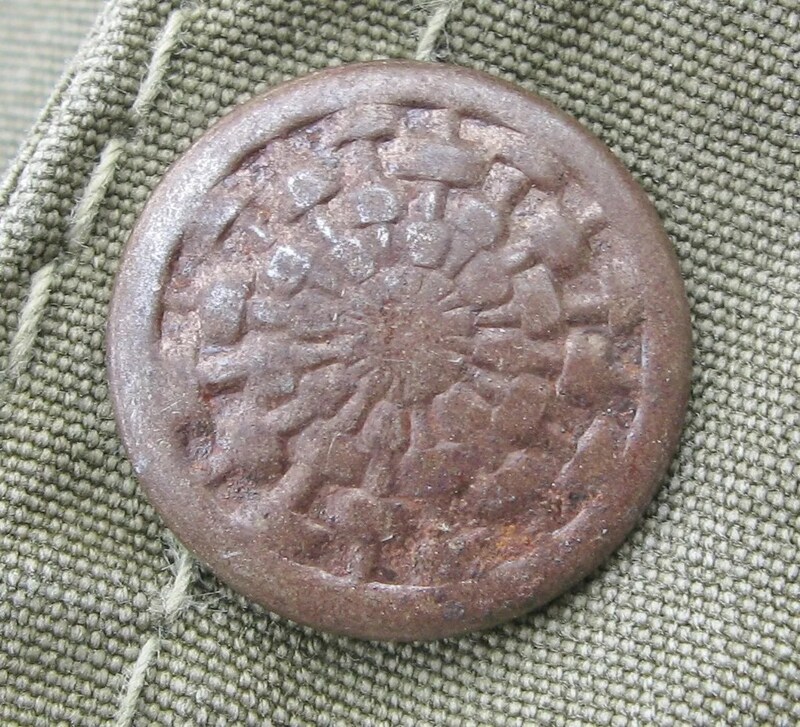 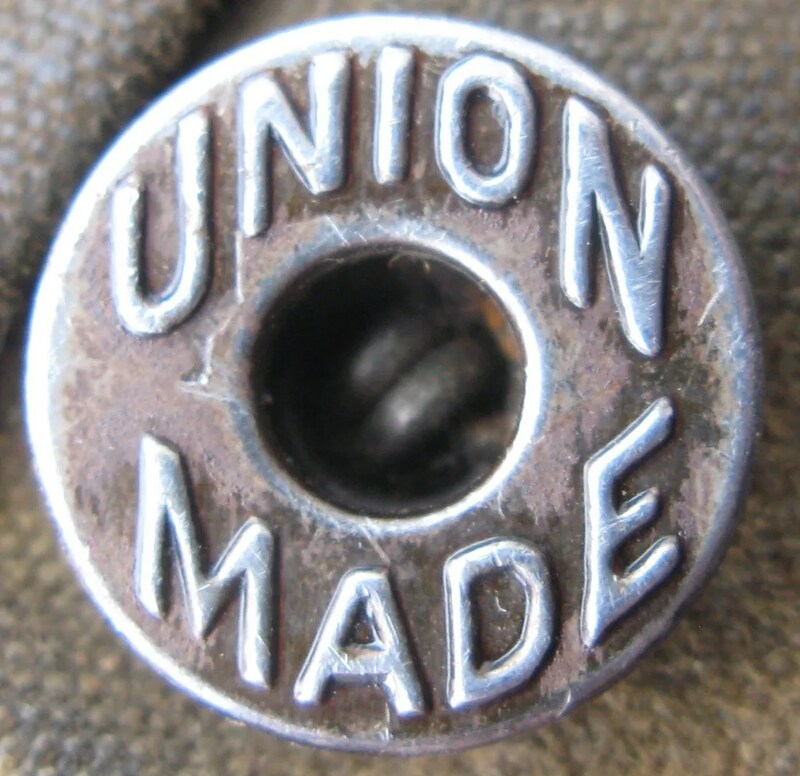 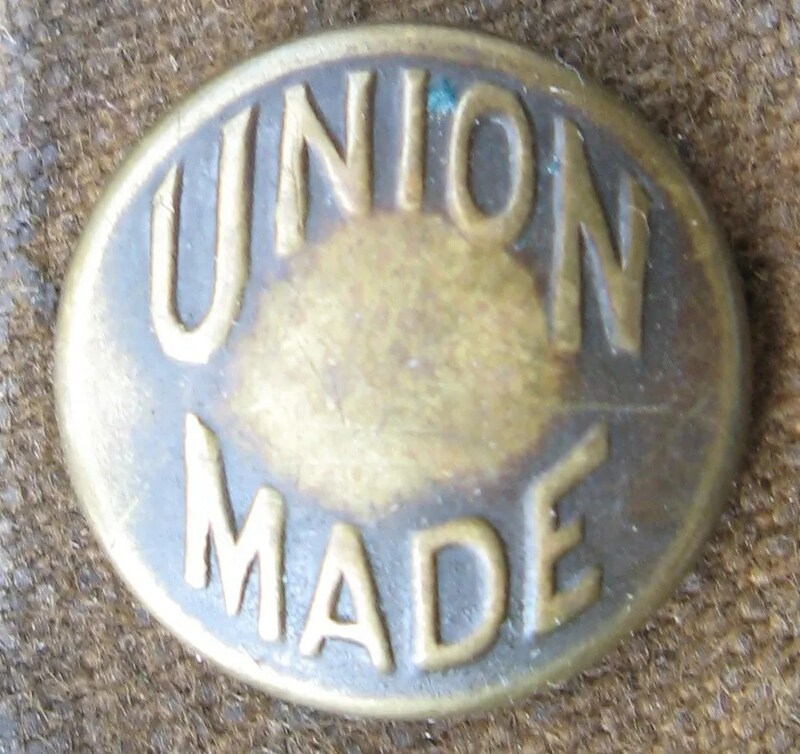 The snaps are all branded “Union Made” as are all the buttons. 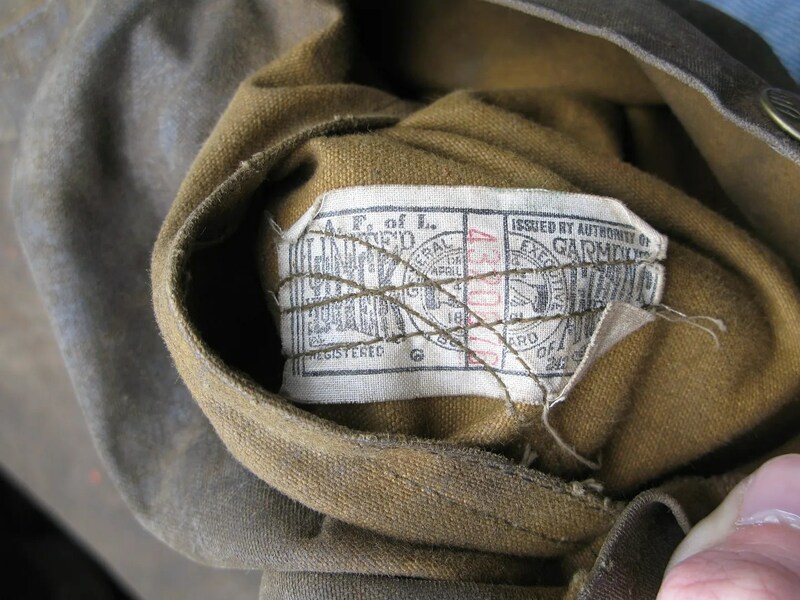 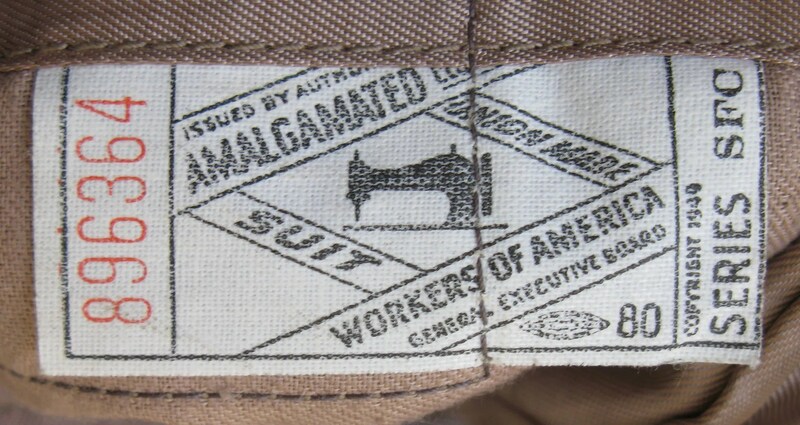 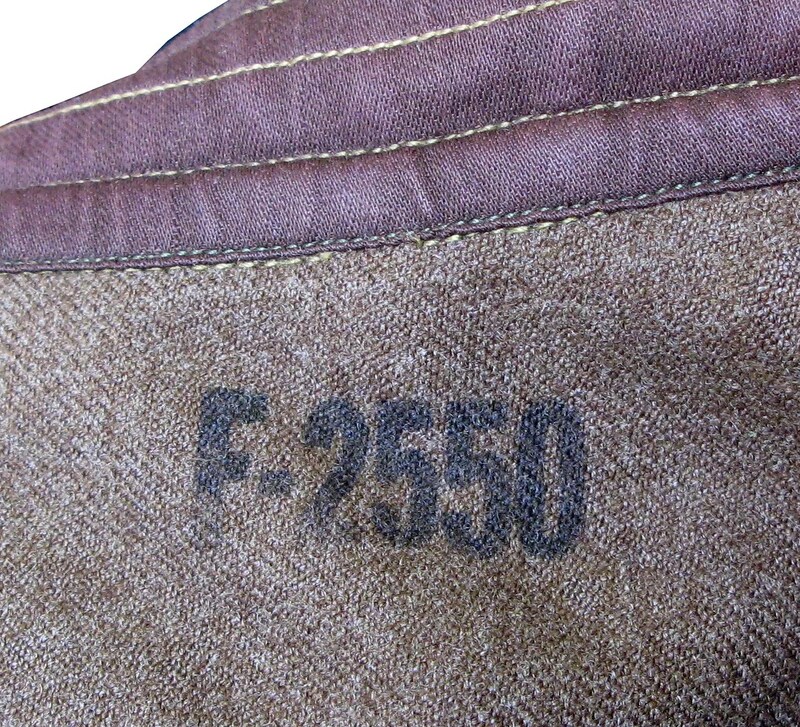 There are union tags from the United Garment Workers of America inside the jacket and inside the flap of the back pocket of the pants. 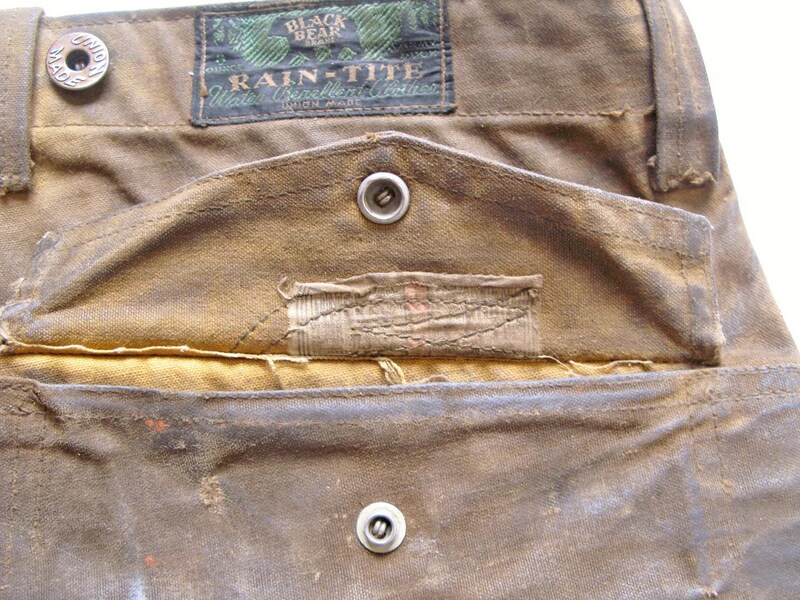 The waterproofing is still good- water beads up and falls right off. 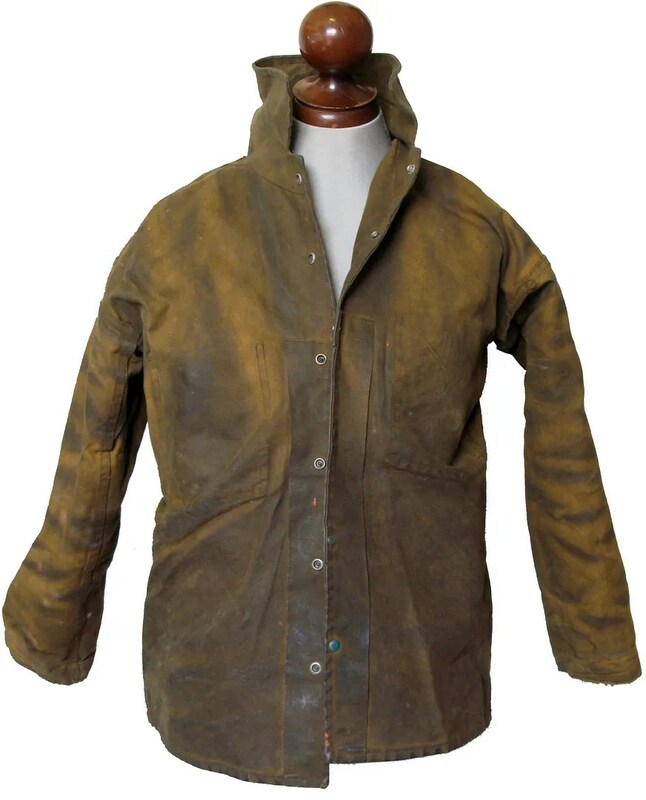 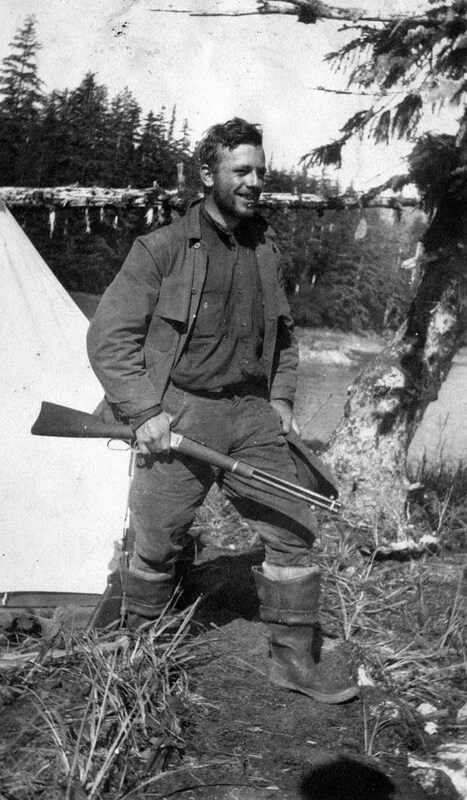 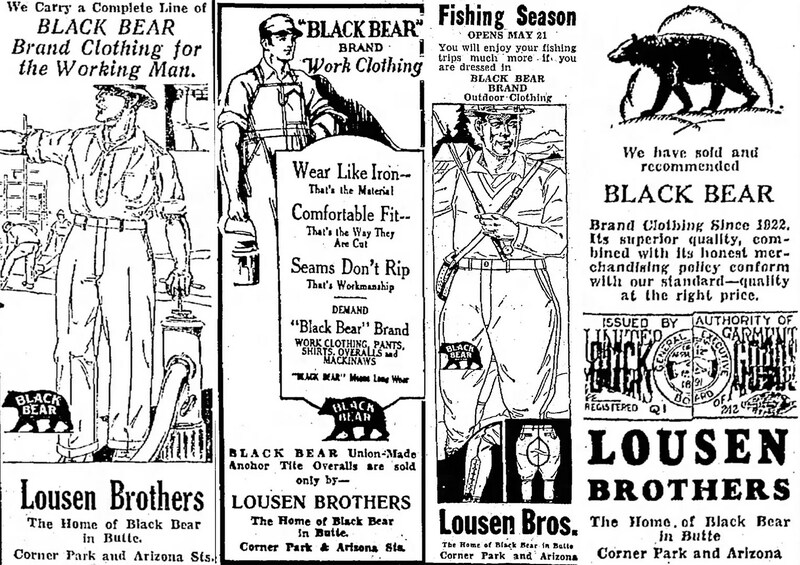 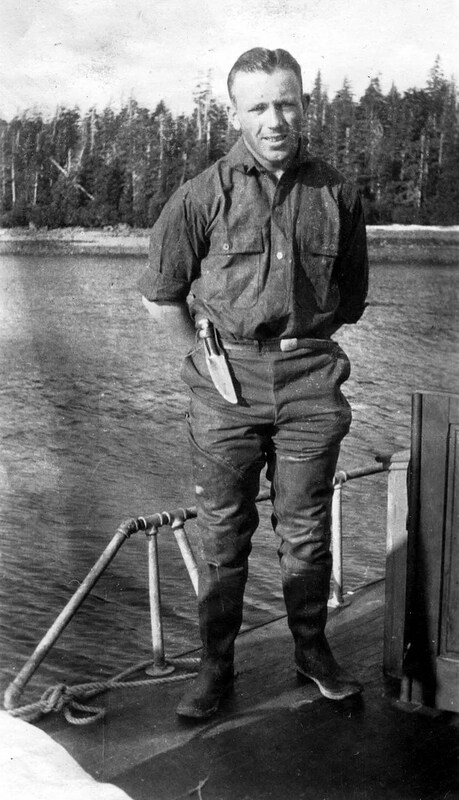 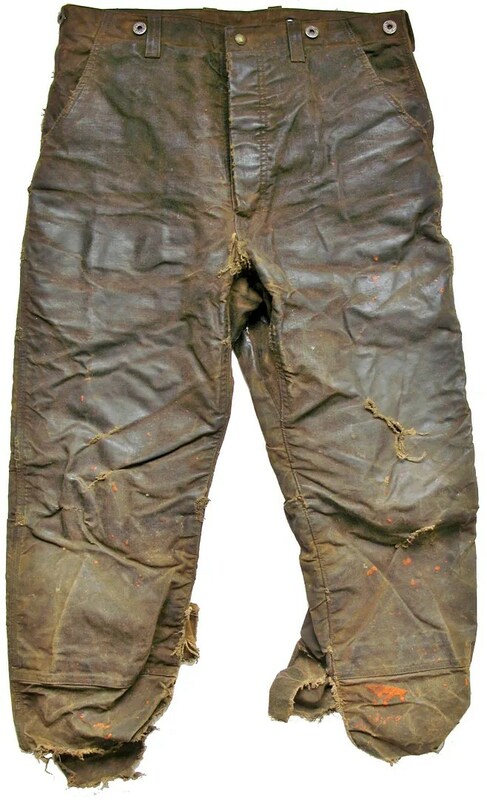 This type of suit was frequently worn by lumbermen in the North West. 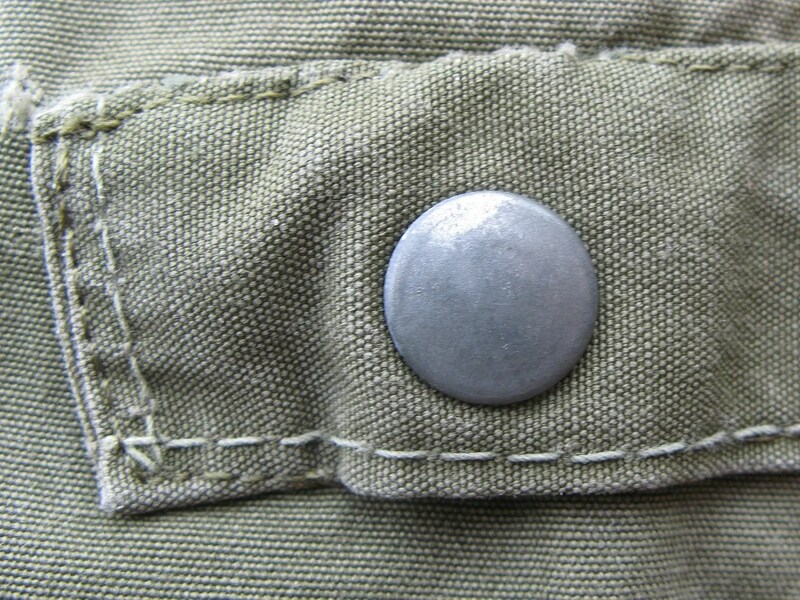 The heavy wear supports this. 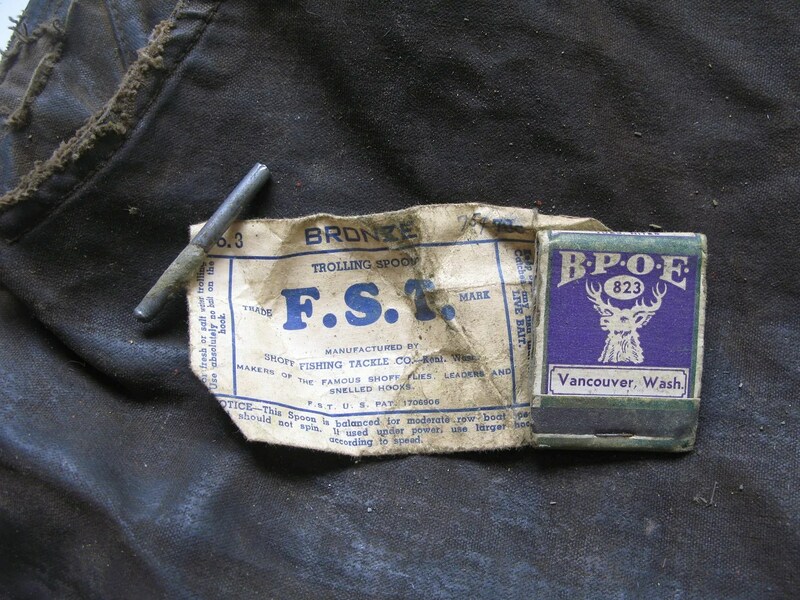 Going by the matchbook, the original owner of this one was probably from Vancouver. 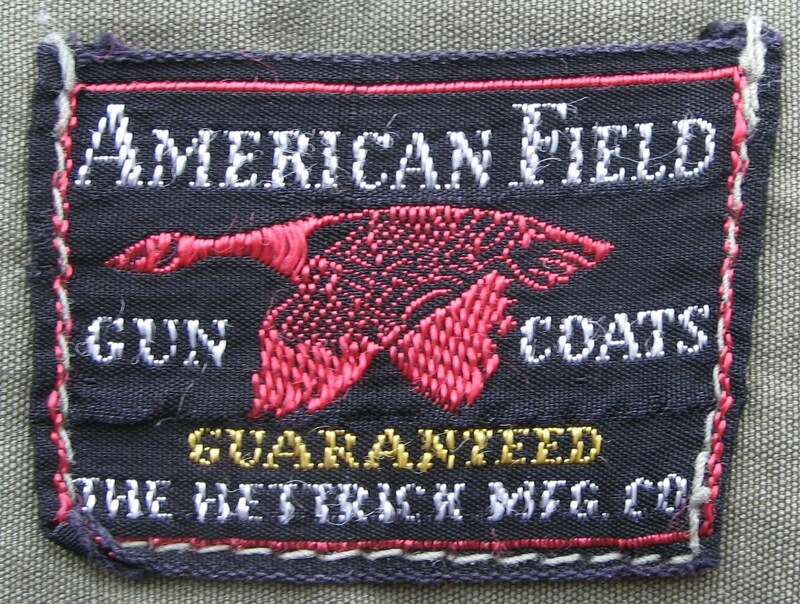 Advertisements for this model from 1940s Hettrick Mfg. 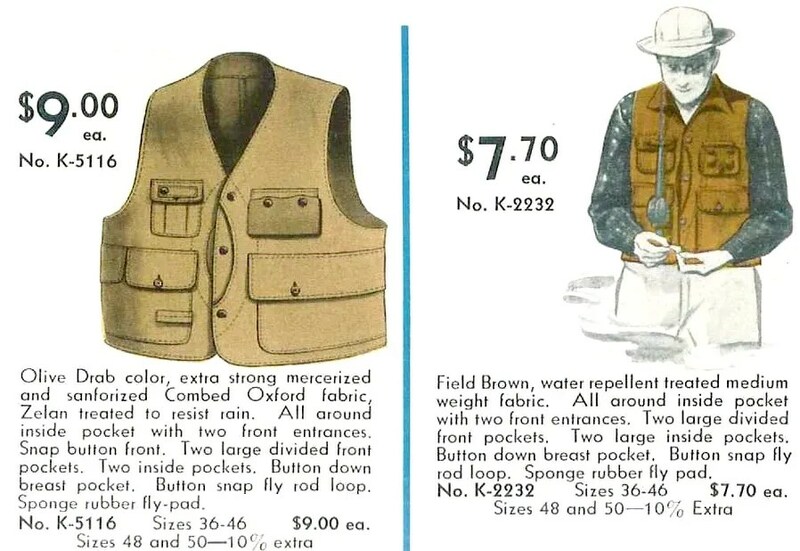 Co. catalogs. 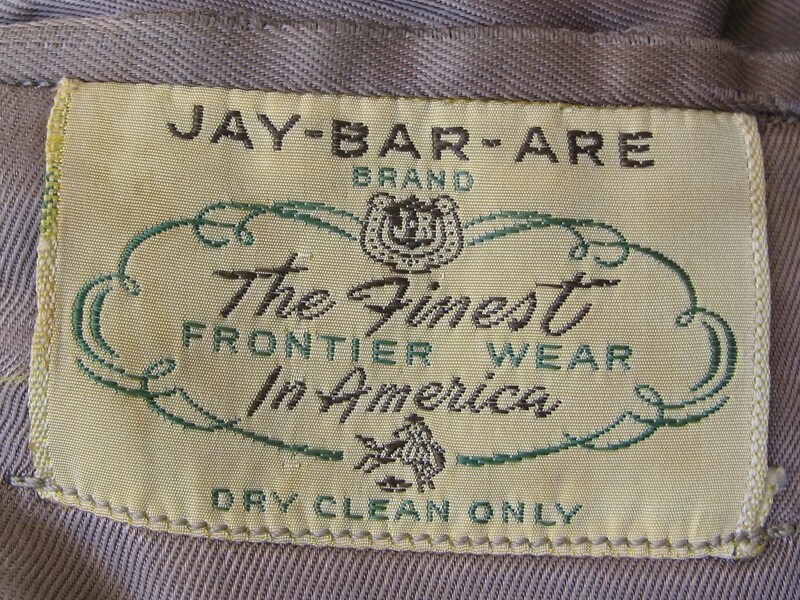 This vintage jacket was made by Jay-Bar-Are brand. 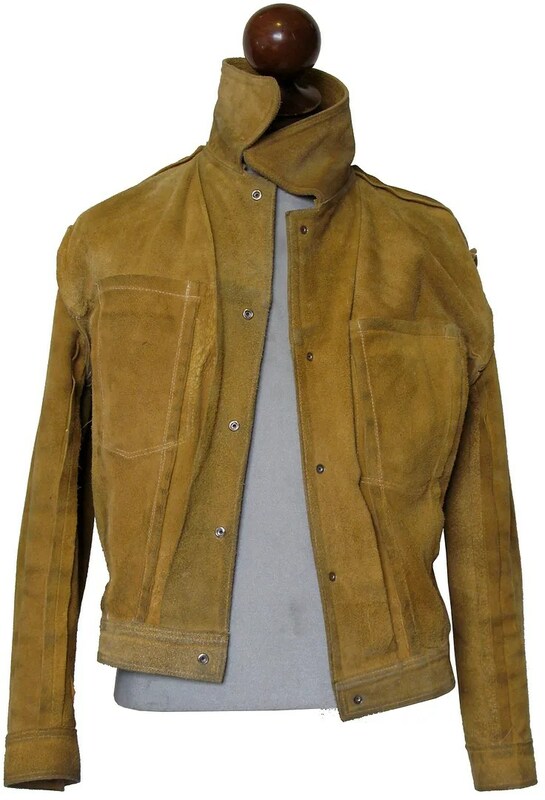 It is made of wool gabardine in a half-belt style.Despite the western brand name, the style itself is essentially a fabric version of the horsehide leather jackets of the 1930s and 1940s. 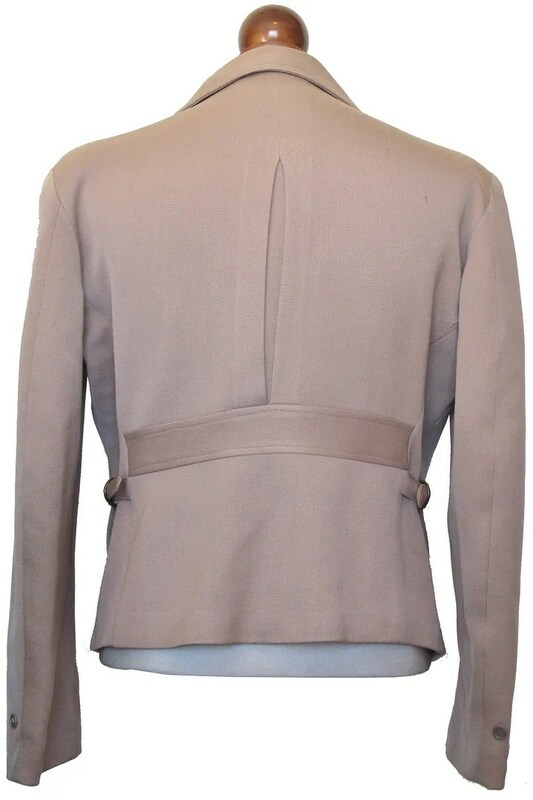 The back is belted, with a center pleat. 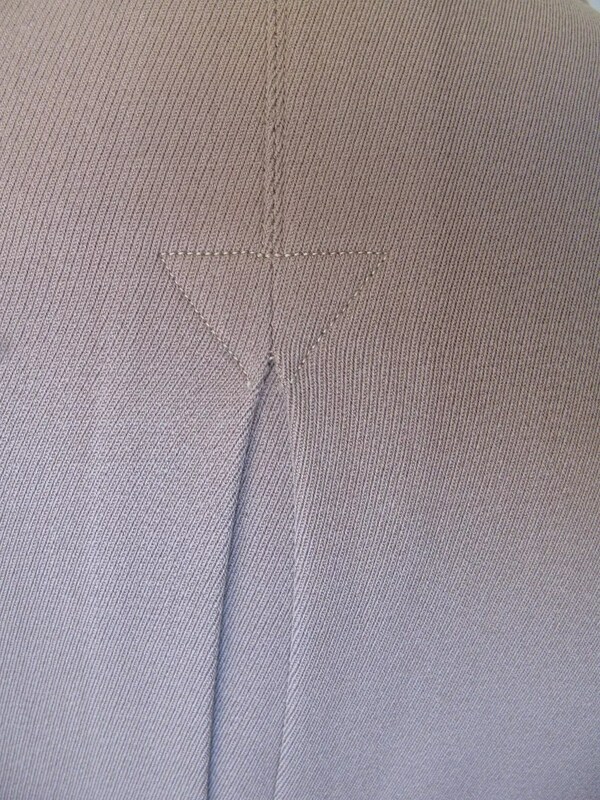 The pleat has an arrowhead reinforcement stitching detail at its top. 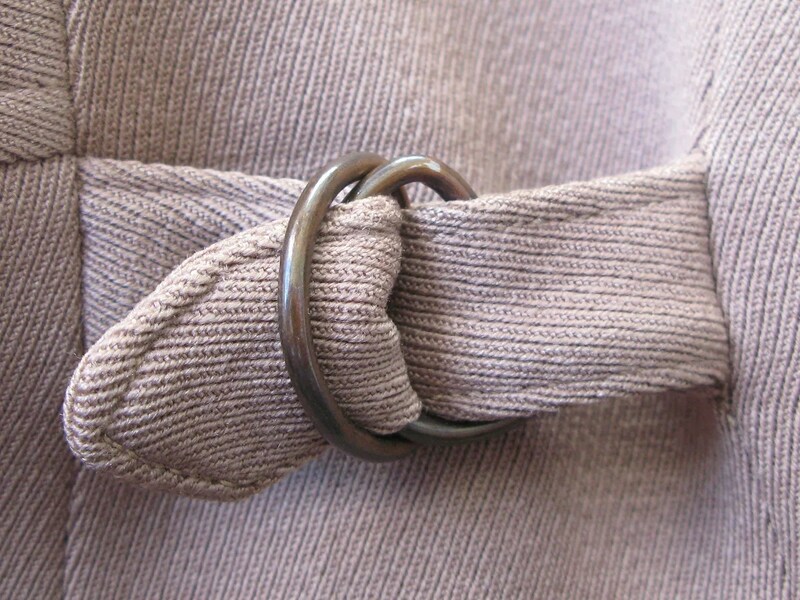 There are side adjuster belts with D-rings. 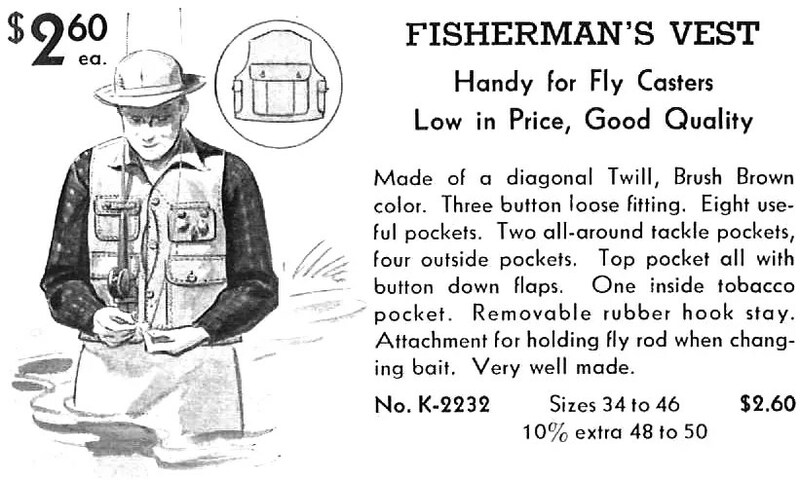 The front has handwarmer pockets and a zipped breast pocket. 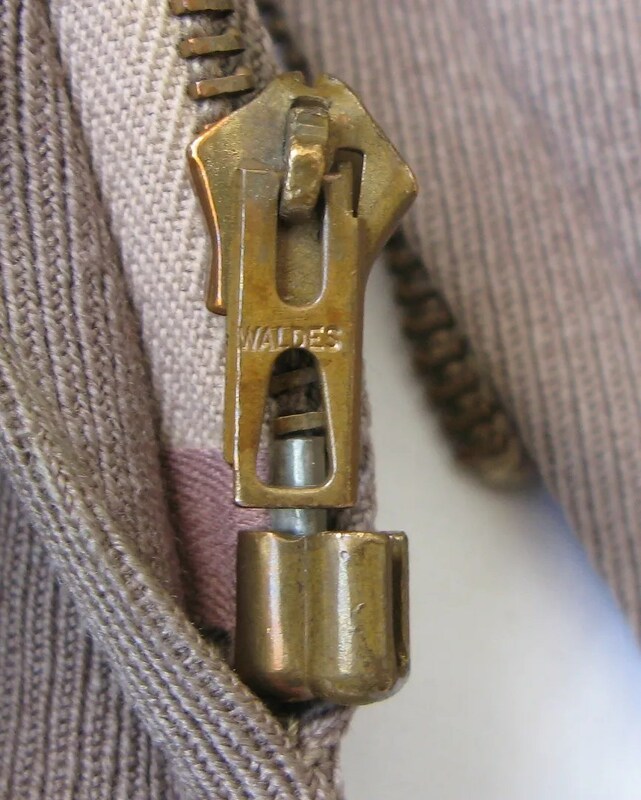 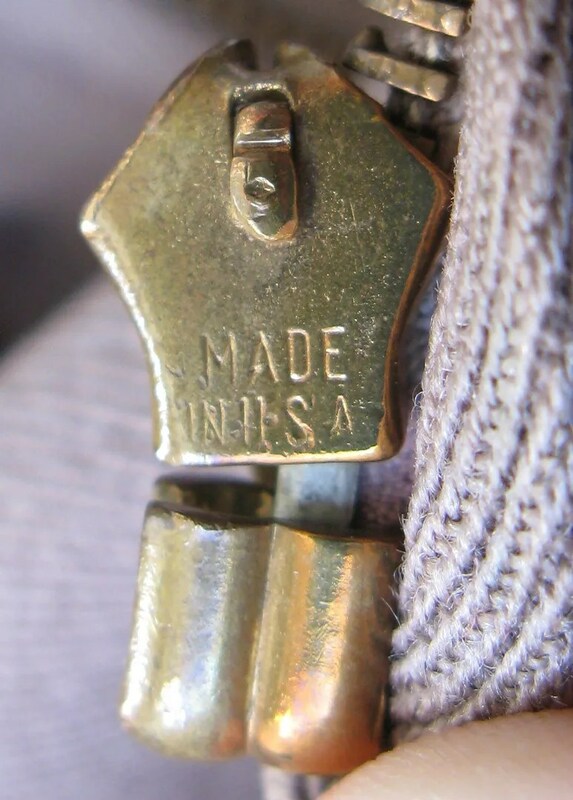 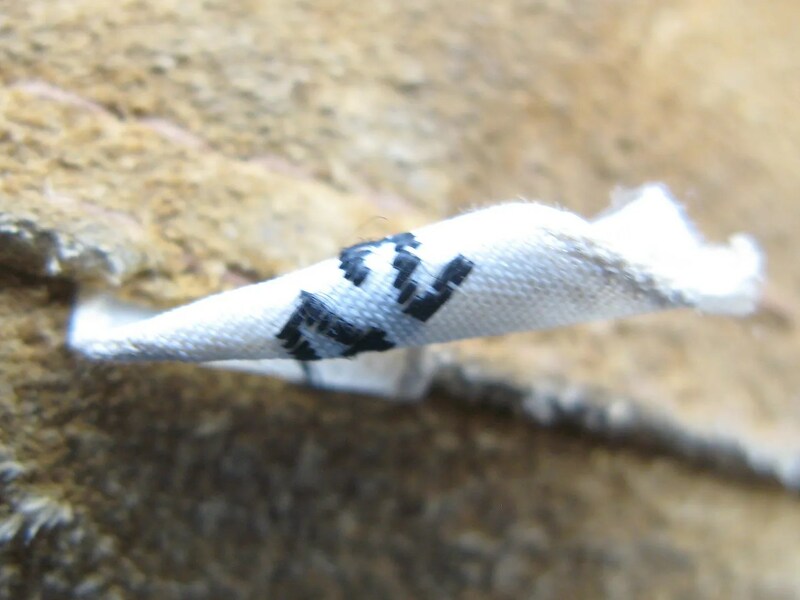 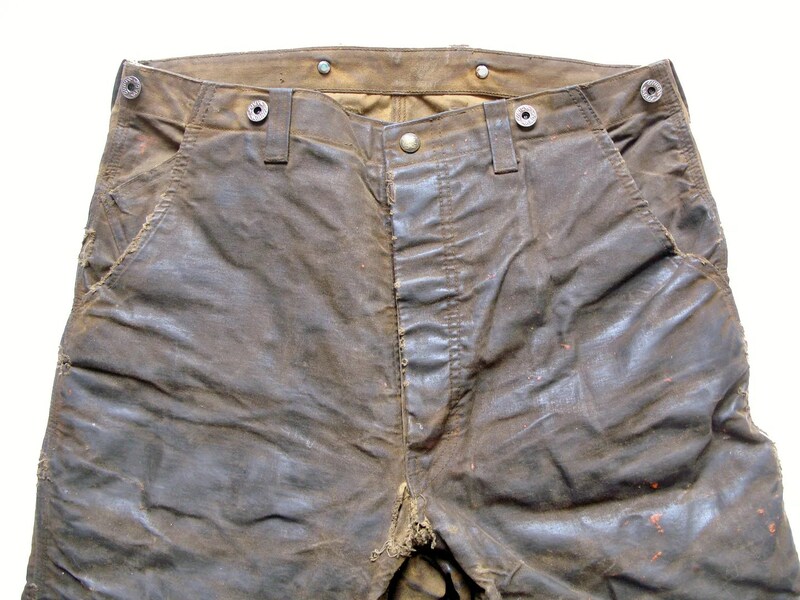 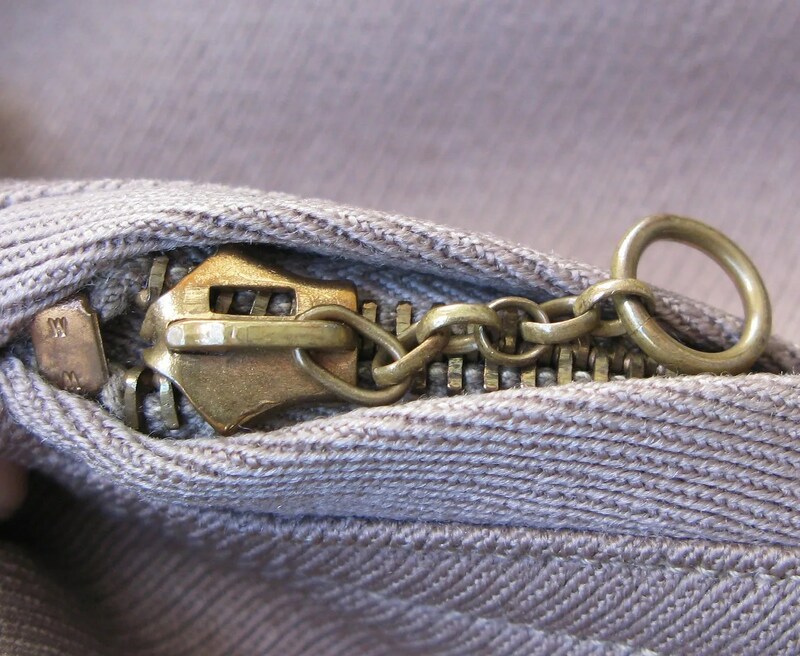 The zippers are all rare Waldes brand, they style produced in the late 1930s and early 1940s.